We knew it wouldn’t be long before team Harrison & Driscoll would break out and win one. We had no idea it would be the Club Championship. This makes at 2 in the last 4 years. Awesome!!!! 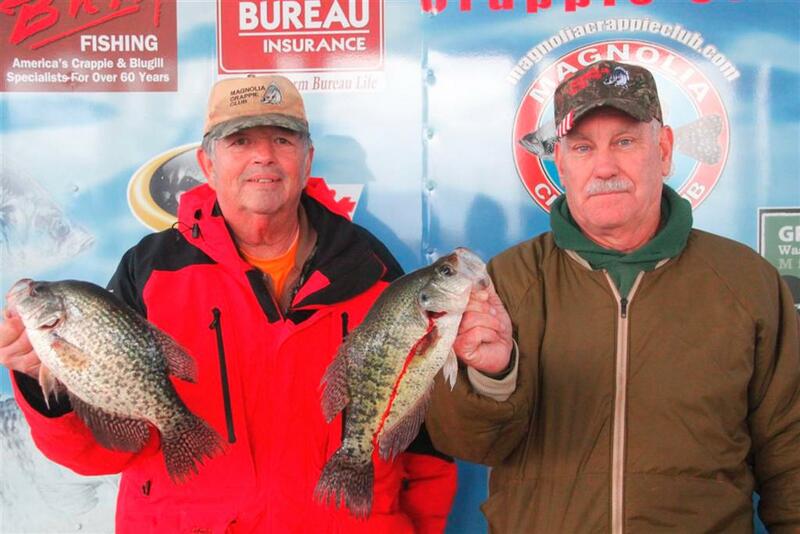 John Harrison & Kent Driscoll blew everyone away with 12.71#’s to win their 1st tournament of the 2013—2014 season. 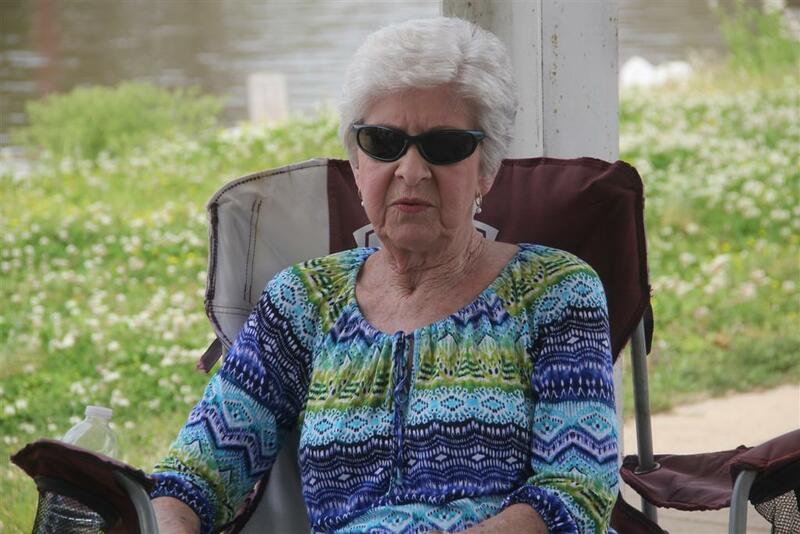 We were sadden to hear that Kent’s grandmother-in-law passed away on Tuesday and had to attend to family matters; our condolences go out to Kent, Barbara & Mary-Kent. 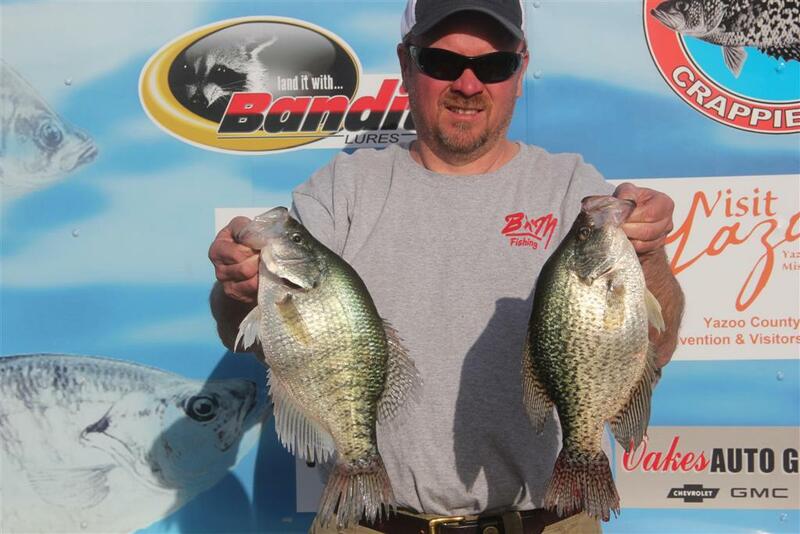 John fished solo both days; Friday he could only use 3 poles; Sardis Lake rules; Saturday he could use 5 poles. It really didn’t matter. 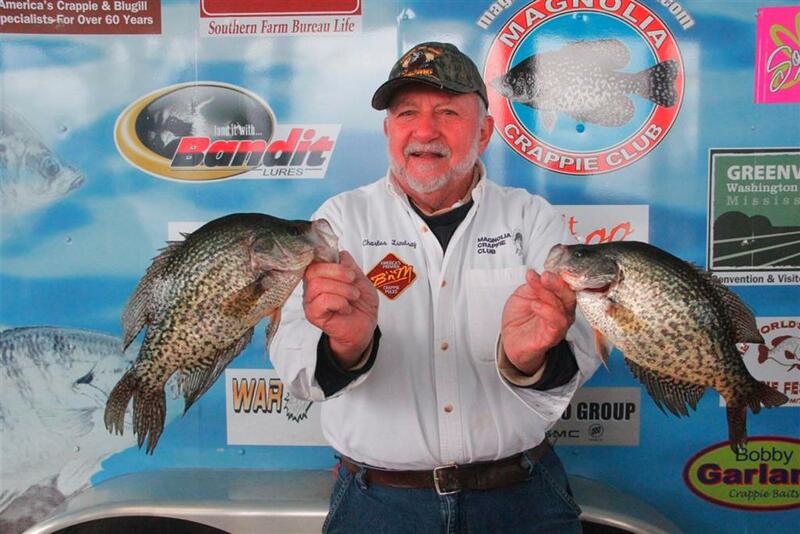 John could catch a boat load of crappie with a bean stick. Great fishermen get their skills by spending time on the water; it’s hard to tell how many days John fishes; it’s probably easier to count the days he don’t fish. Chris & Kevin Horton weighed 11.16#’s to finish a strong 2nd. These guys know Enid; they’ve fished the lake all year. I commend them for their slow-trolling and jig fishing skills. Good job my friends. Hugh Krutz & Steve Stevenson finished 3rd with 10.52#’s. These guys are world-class slow-trollers; they stayed with the technique that they have the most confidence with. 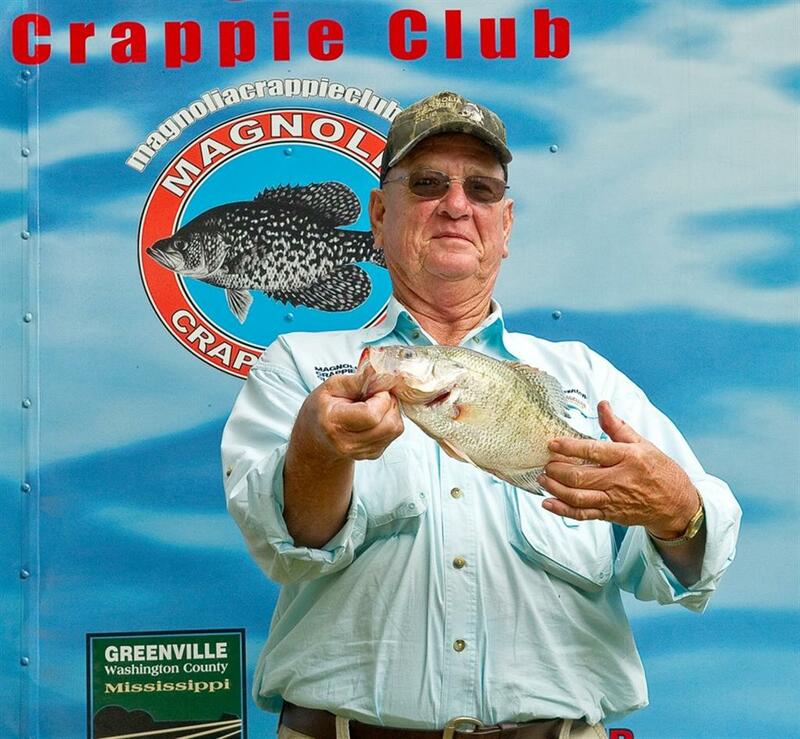 You ask Hugh what’s the best bait for a crappie; he’ll instantly tell you it’s a minnow. Dee & Will Ferguson weighed 10.24#’s to finish 4th. 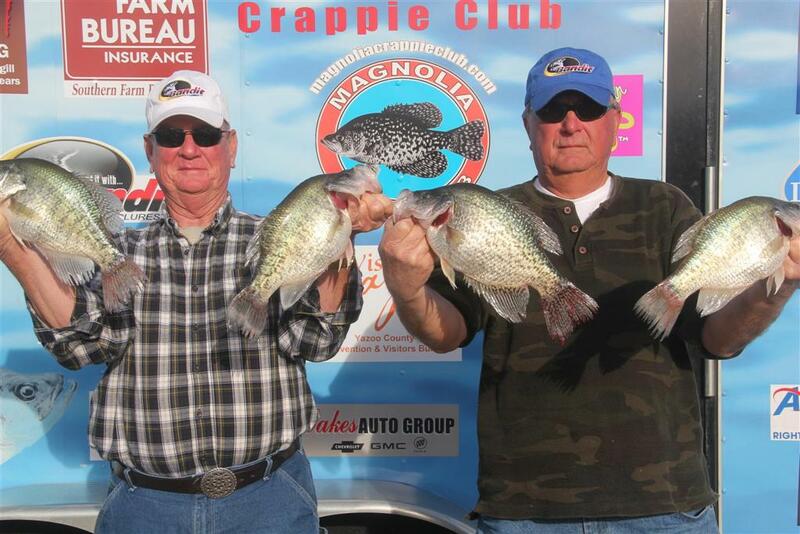 Gotta give it to Dee, he and Will love crappie fishing. Did I mention Will is only 4 years old. Will won the Youngest Club Member Award for 2014; congratulations young man; you’re a class act. I love fishing around Will; he’ll tell you exactly what bait his dad’s using’; all the way down to the distance and color. Way to go Will; we know pretty soon all that will change. 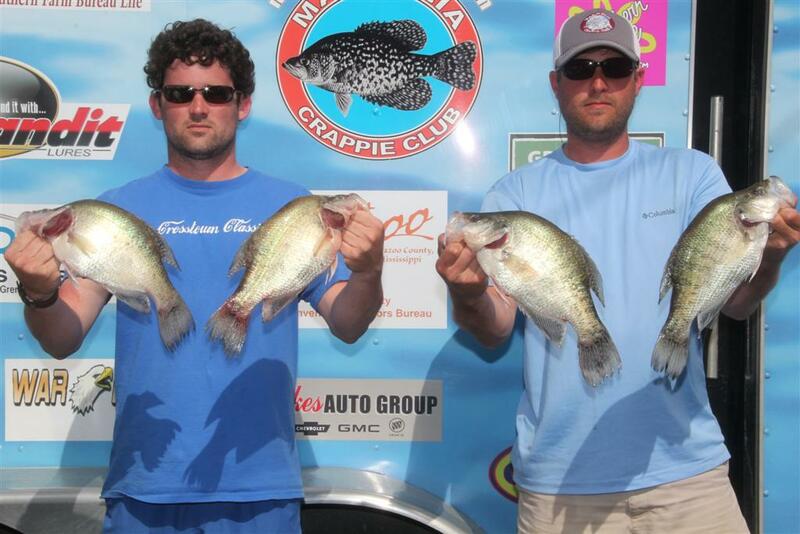 Matt Collier & Chaney Starnes won Day 1 of the MCC Club Championship at Sardis with 11.37#’s. Guess the old saying; “You Can’t Win On Your Home Lake”, just didn’t hold true. Good Job Guys…. Matt & Chaney call Sardis their home lake, well guess they could call Sardis, Enid, and Arkabutla home lakes also. They’re from Southaven, MS; just a rock throw out of Memphis. 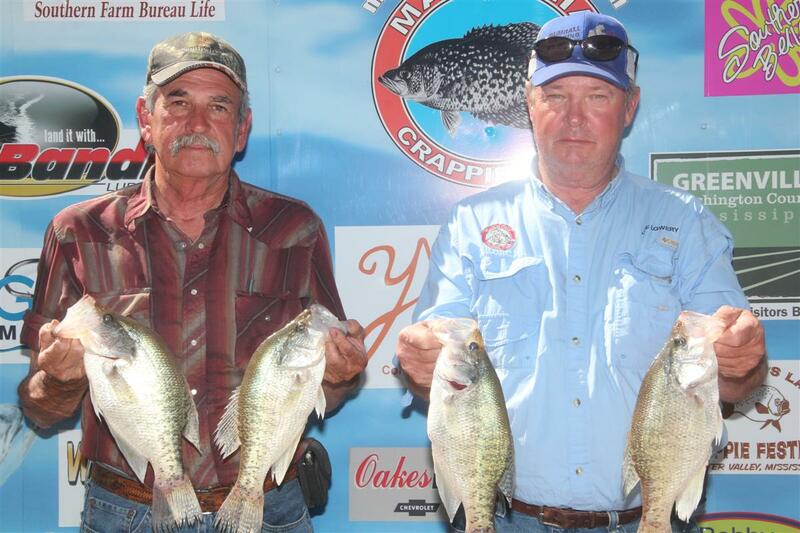 They’ve fished MCC tournaments for several years now; turned out to be some outstanding crappie fishermen. Almost a year ago, Chaney purchased a new fishing boat; a 22’ War -Eagle center console with a 4-stroke Yamaha. Man, that thang is awesome. It’s paying off now. 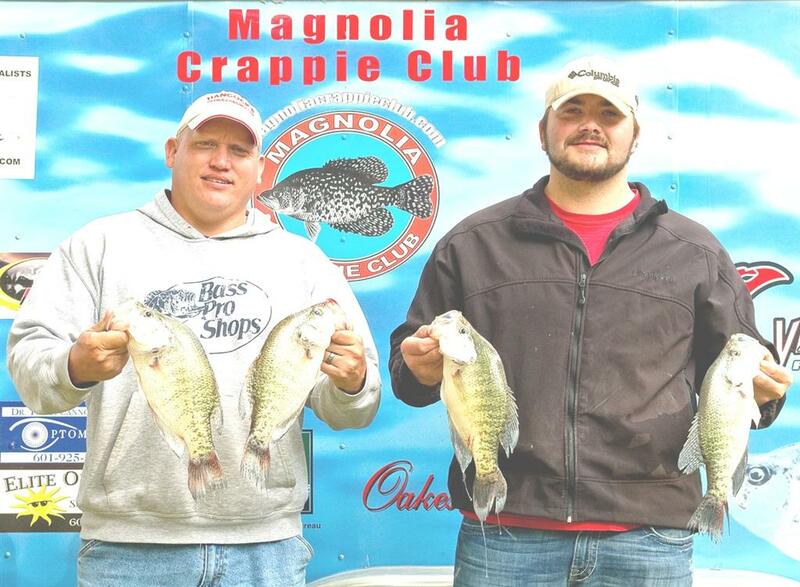 Matt & Chaney were good before they joined MCC; they’ve gotten even better, guess it don’t hurt to live near the best crappie lakes in the country. David McWilliams & Robbie Niven finished 2nd on day one with 10.94#’s. These guys caught their best fish long-lining in the marina. Robbie & David are good fishermen. They’ve added new techniques to their arsenal; long-lining and crank-baits. 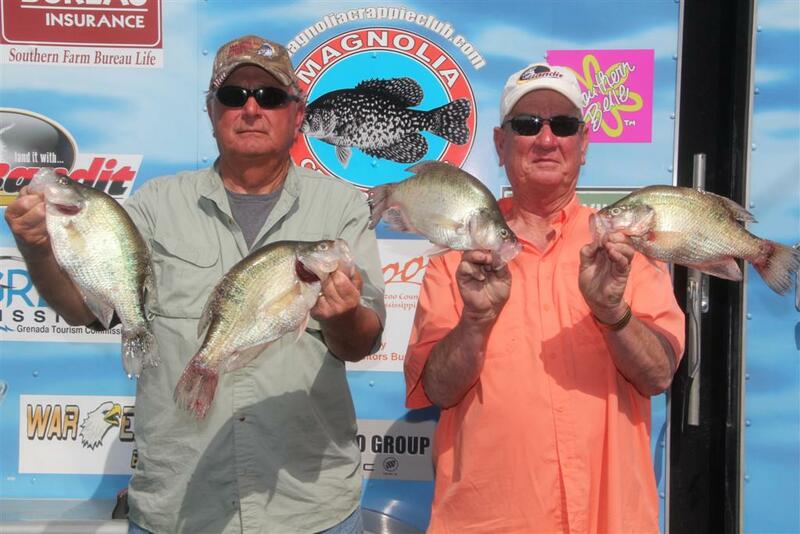 We had a new team finish in 3rd, just kidding; Rabbit Rogers & Pat Jeffcoats weighed 10.50#’s. Talked to Rabbit afterwards to see where and how they caught their fish. Rabbit went ole school; jig & jig pole around the stumps near Holiday Lodge. Rabbit said they would put the jig around a stick or tree and within a few seconds it felt like a stick of dynamite went or in your hand, or like a runaway freight truck had the jig. Wow, that seemed like lots of fun. 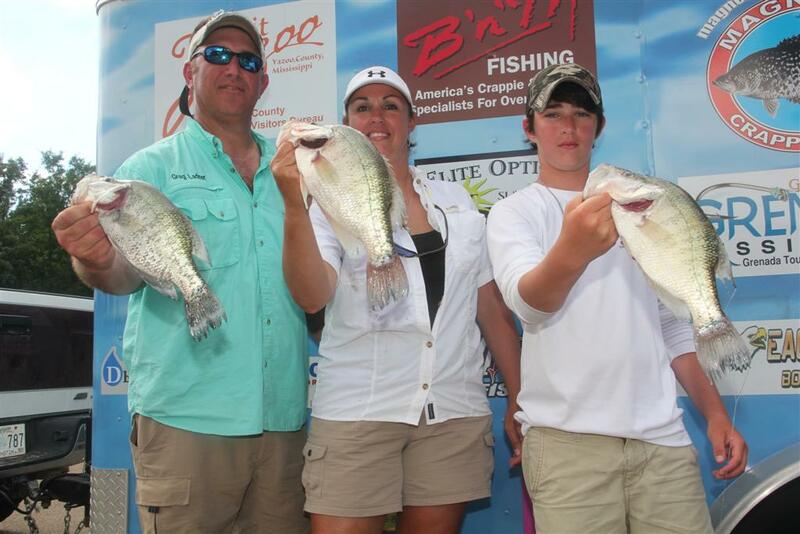 Greg, Ginger & Collin Ladner weighed 10.41#’s to finish 4th. I watched them long-lining around Clear Creek all day; catching fish after fish. I hate to admit it but we’ve trained this team to long-line a little too good. They love this technique and use it every chance they get. 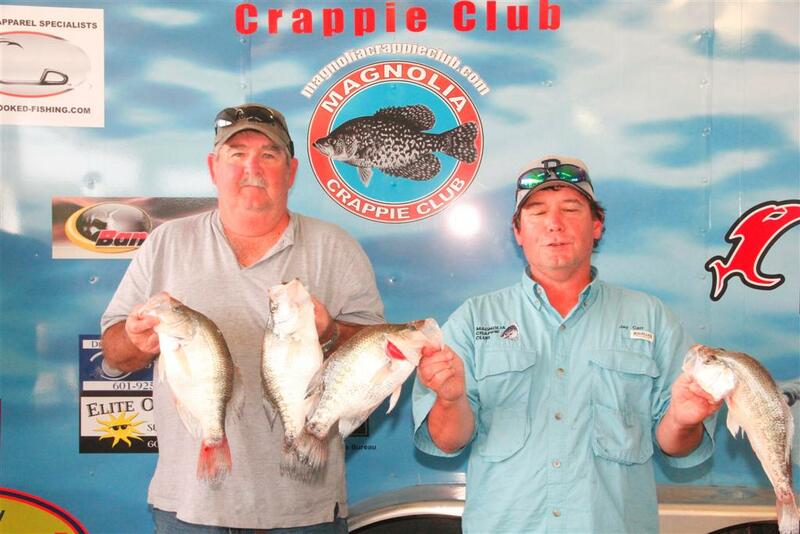 I can’t believe they drove over 400 miles to fish a crappie tournament. Hey Greg, y’all live on the coast, you need to go saltwater fishing and leave the crappie fishing to us “po folks”. Robbie Niven & David McWilliams finishes 2nd with 10.94#’s. Excellent job guys. Congratulations!!! Rabbit Rogers & Pat Jeffcoats finished 3rd with 10.50#’s. Rabbit & Pat consistently make the top 5. Good job, way to go………. Greg, Ginger & Collin Ladner finish 4th with 10.41#’s. Not too shabby for a group of Gulf Coast Fishers. Good Job Collin. David Thornton & Shelton Culpepper finished out the top 5 with 10.36#’s. Guess them dead minnows were the ticket. 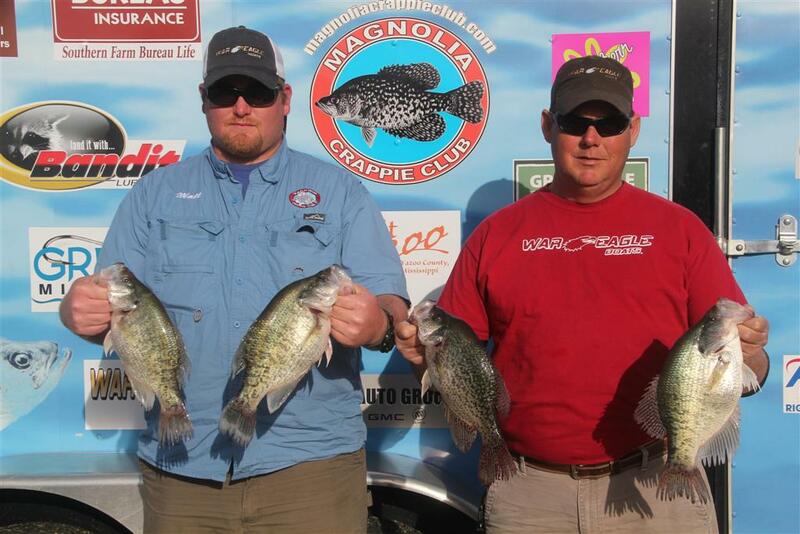 Good Job…..
Greg, Ginger & Collin Ladner were big fish winners with a 2.01# slab. 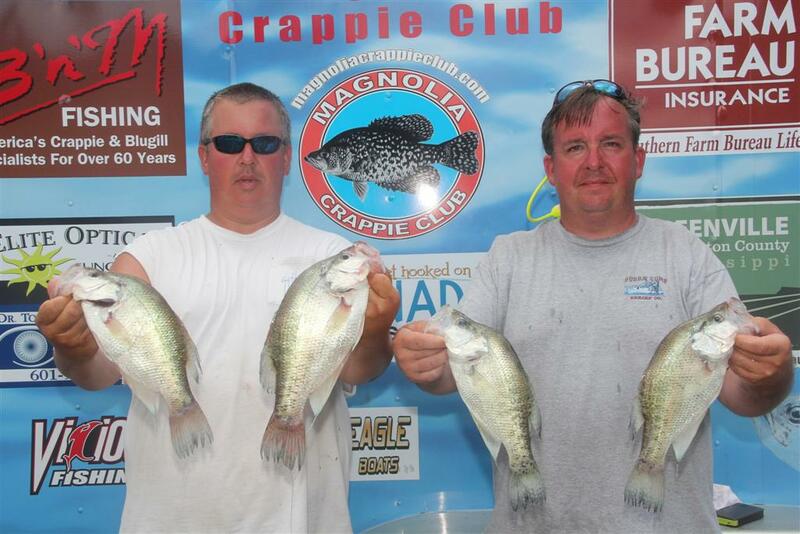 Brad Chappell & Bo Hudson were 2nd Big Fish winners with a 2.00# slab. 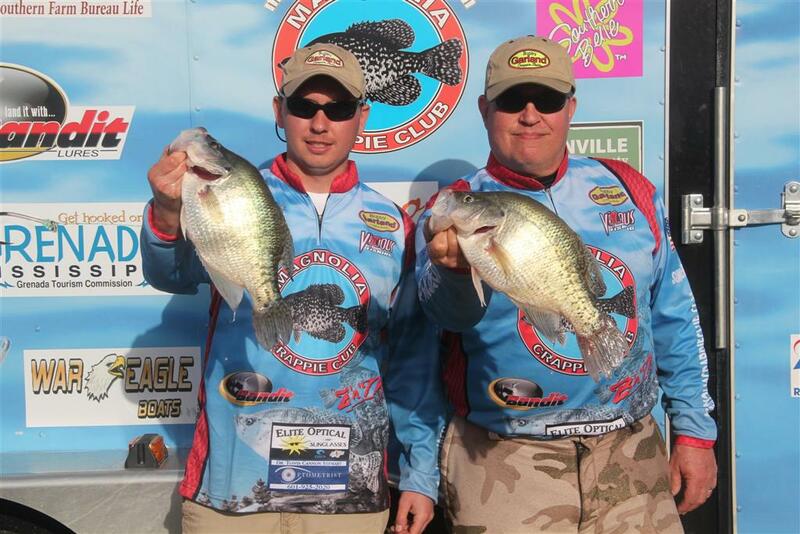 Chris & Kevin Horton weighed 11.16#’s to finish 2nd. A drop of water makes a big difference Excellent job guys. Congratulations!!! 3rd place was captured by Steve Stevenson & Hugh Krutz with 10.52#’s. Hugh & Steve consistently make the top 10. Good job……. 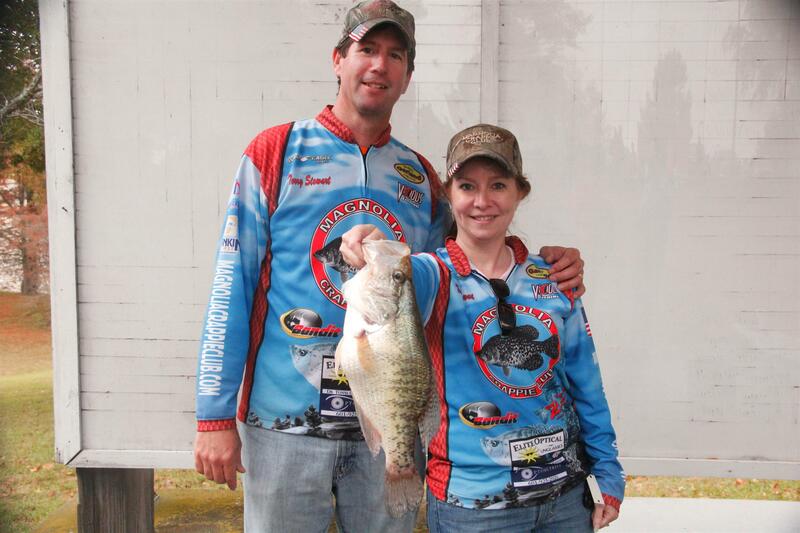 Dee & Will Ferguson weighed 10.24#’s to finish in 4th place. Will you’re too lucky; I need you in my boat………..
Bernard Williams & Don Terry round out the top 5 with 10.22#’s. We do good when we weigh the right bucket. Oh well !!!! 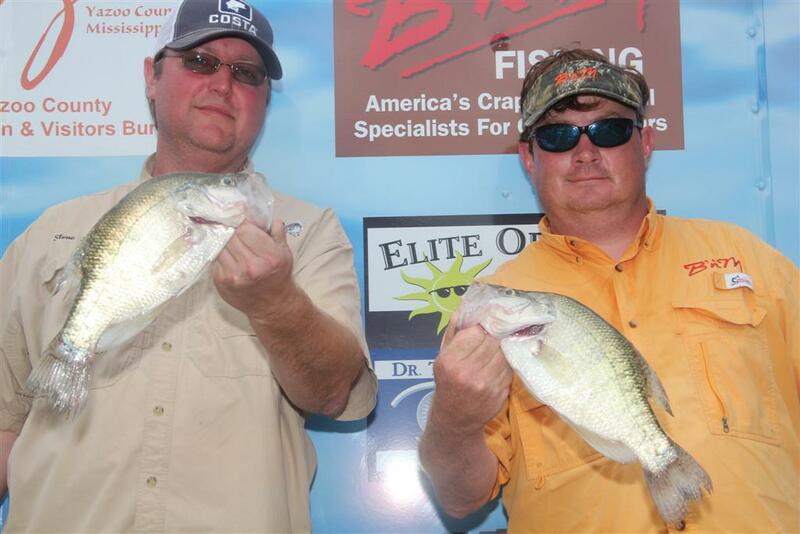 Chris & Kevin Horton caught a 2.22# slab to win the Big Fish of the Day and Tournament. Enid winners Brian Fletcher & Kevin Stockbridge with 11.49#’s. Way to go guys, y’all had a good payday, winning both MCC Enid Open & the Cappie.com Fruitjar Tournaments. Good job my friends…. Enid Lake is one of the MCC tournaments I look forward to fishing each year. You hear reports from Enid all spring of great catches. Brian & Kevin showed us that the reports were true. These guys came to the scales with just enough weight to surpass Joe Lowery & Randy Bouchillon by .01 pounds; that’s right only a drop of water separated the two teams. Way to go Brian & Kevin, sorry Joe & Randy. Brian & Kevin say they caught their fish pushing minnows nearly 1mph; with some poles set at 3’ deep and some set on the bottom in 10’ to 14’ of water. Now Joe and Randy caught their fish in the same depth of water pushing minnows much slower; their poles were set around the 6’ to 8’ deep. So you see there was really no pattern established; just had to cover as much water as possible. Our 3rd place winners were the team of Vic Finkley (Uncle Vic) & Kim Gray with 11.32#’s. I had predicted they would be the winners; seeing how they guide on Enid 100 days a year or more. Vic & Kim broke out the new deck boat on Enid. It’s a cross between a pontoon boat and a bass boat. It has a 4 cylinder inboard that’s quiet and gets excellent gas mileage. Vic says it takes rough water better that any boat in his arsenal. It’s got to be the ticket for them to get out of that 22 foot Ranger. Coming in at 4th was the team of Rabbit Rogers and Pat Jeffcoats with 10.73’s. I thought Rabbit and Pat didn’t like the Big-4 Lakes in North MS; boy was I wrong. These guys were 2nd in the points standings; hoping to top John Harrison & Kent Driscoll for the points championship. The only way I saw for Rabbit & Pat to make up the points needed was for John & Kent to BOLO; not catch a fish, if you know John like I do; that’s not going to happen. Well, Enid was not the lake to make up the 3+ pounds needed to win the points championship. Congratulations to John and Kent for winning the points race. You guys never won a tournament but with consistent top finishes you stood the test, way to go my friends. Rounding out the top 5 was the team of Jimmy & Ricky Smith with 10.70#’s. It was good to see Ricky back in the boat after his back surgery. This man has suffered for a while with back problems; I hope and pray the doctors got this one right. If you’ve never had back pains it’s no way to explain the excruciating pain. Ricky says it a lot better now; at least he can sleep. Ricky kept a positive frame of mind during his ordeal. I asked him before the surgery how he was doing, he said: “Well Bernard, I’m still on the good side of the dirt”. Now that’s called hanging in there and playing the cards you were dealt. This has got to be Jeremy Aldridge’s lucky (Blessed) year. Jeremy and Clint Egbert have won 2 tournaments, the Rookie of the Year Award and now the $1,000 Academy Gift Card. Wow, let’s go to the Boat!! Congratulations to Jeremy Aldridge for being the lucky winner in our Splash-4-Cash Fundraiser. Jeremy won the $1,000 Gift Card donated by Academy Sports. Each MCC member is asked to sell 25 - $5 tickets. Most members buy all 25 tickets; not Jeremy, he sold all his tickets except 7 or 8. I guess you only had to have 1 ticket to win and he won. I told him the rules say you have to split the winning with his partner, Clint. I guess we’ll have to wait on the results from that conversation. Paul Johnson even offered him $500 for the gift card to no avail. I’m kinda like Jeremy, I would’ve have sold it either. I told Jeremy he had his wife’s Christmas gift already, $100 for her and $900 for him; guess we’ll have to wait on those result too. We have another update on Paul Johnson’s Race-Within-A-Race. He stated earlier that he’s beaten Team Charles Lindsay and Team Tommy Moss & Brad Calhoun 4 out of 7 times this year, well it’s over now, 5 out of 9; Paul and Gil are the winners. Tommy & Brad had other obligations on Saturday and couldn’t fish; so by default Paul & Gil were the winners. However the points race was a different story; Tommy & Brad beat the brakes of Paul & Gil; so did Lindsay & Lindsay. Personally I think Paul & Gil would’ve done a lot better if they had stopped pulling crankbaits in August instead of January. On another note, it’s great to see Paul keep a partner for an entire year; that’s another first I forgot to mention earlier. Well, we’re finished with the 2013/2014 season. We’ve got over 35 teams that qualified for the championship tournament on May 30th & 31st. We have a split tournament this year with one day at Sardis and one day at Enid. Should be excellent fishing at both lakes. We’ll be fishing for $20,000; that’s right we’ll payout $10,000 each day, with the overall winner getting $500 extra. Y’all better get them minnow poles, crankbaits, longlines and jig poles ready; then go for what you know. Everyone will have the same advantages. Randy Bouchillon & Joe Lowrey were 2nd with 11.48’s. A drop of water makes a big difference Excellent job guys. Congratulations!!! Kim Gray & Vic Finkley finished 3rd with 11.32#’s. Vic & Kim consistently make the top 10. Good job, way to go………. Rabbit Rogers & Pat Jeffcoats placed 4th with 10.73#’s. Sorry guys, not enough to catch Harrison & Driscoll in the points race. Jimmy & Ricky Smith finished out the top 5 with 10.70#’s. Good to see Jimmy get his partner back in the boat. It’s on now. 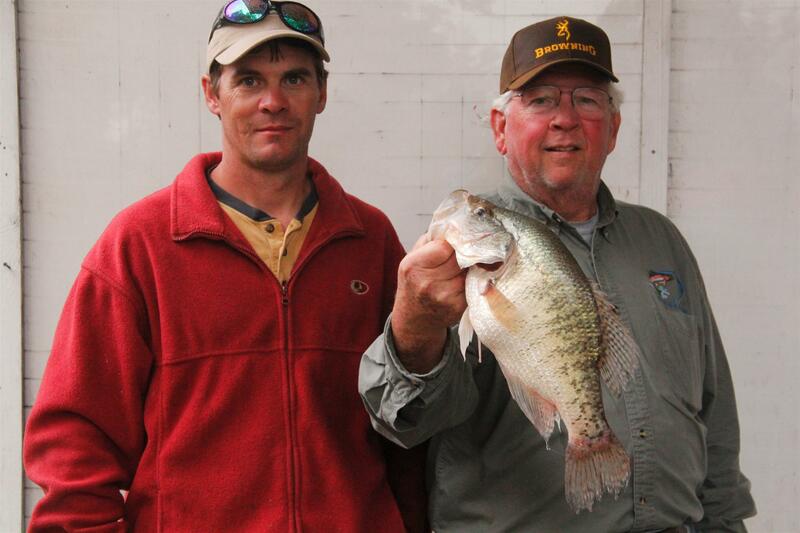 Jimmy & Ricky Smith had a 2.13# post spawn slab to capture the Big Fish Honors. It was the only fish weighed over 2 pounds. Now that seems very strange for Enid; oh well that fishing. 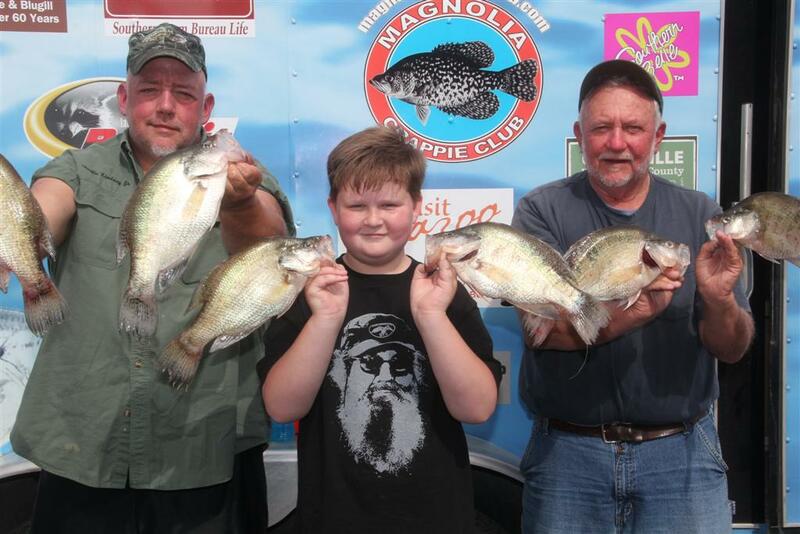 Barnett Winners Charles Lindsay, Jr. & Grandson Taylor Martin, & Charles Lindsay, Sr. with a 7-fish limit weighing 14.79#’s. They had a 2.74# big fish. I hear Taylor caught the big fish, AGAIN!!! It’s something about the Barnett Reservoir that fires up the Lindsay's. I saw the old man (Charles Sr.) on Friday; all he could talk about was beating Rabbit Rogers. He seemed obsessed with not just doing well, but winning the Barnett Tournament. Well, guess he got his wish. These guys had a secret weapon, Taylor Martin. Taylor is Charles’s grandson. He’s fished with them before. Taylor’s mother, Dustie, partnered with Charles Sr. for a few years until Taylor and his sister Kathryn came along; all that was over once Dustie got some young'uns. 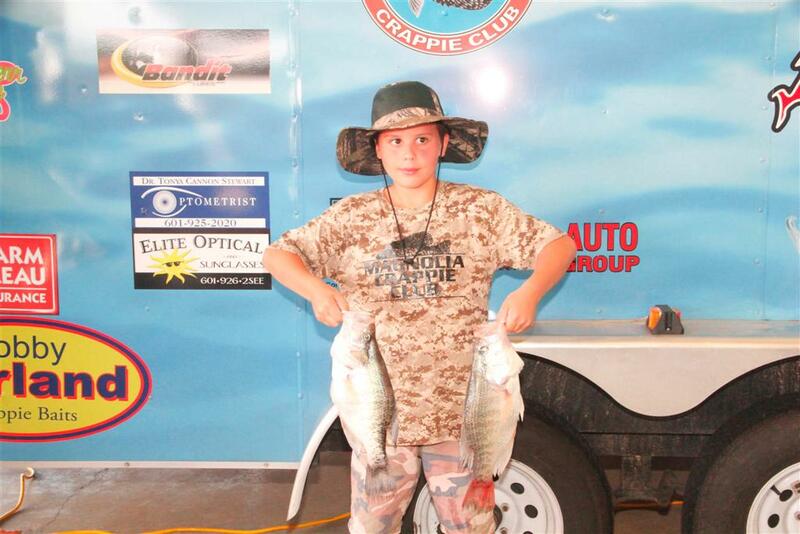 When Taylor was old enough to walk, grandpa began teaching him the art of crappie fishing. It seems he took to fishing like a duck to water. Wish I had him as my partner. Taylor is not a big talker, just a good fisherman. Finishing 2nd was Keith Sullivan and Monty Blount with 13.51#’s. This team is no stranger to the winners circle, they’ve won Barnett several times. Keith says they caught their fish in Oil Well Woods. I fished within eyesight of Oil Well; I could see that they had plenty of company. It must have been 20 boats or more in that area before the wind started to rise. It’s just my luck to pass by the best spots, again. Third place was captured by the father-son team of Sid and Scott Steen with 13.44#’s. I asked Scott if they pulled crank-baits. 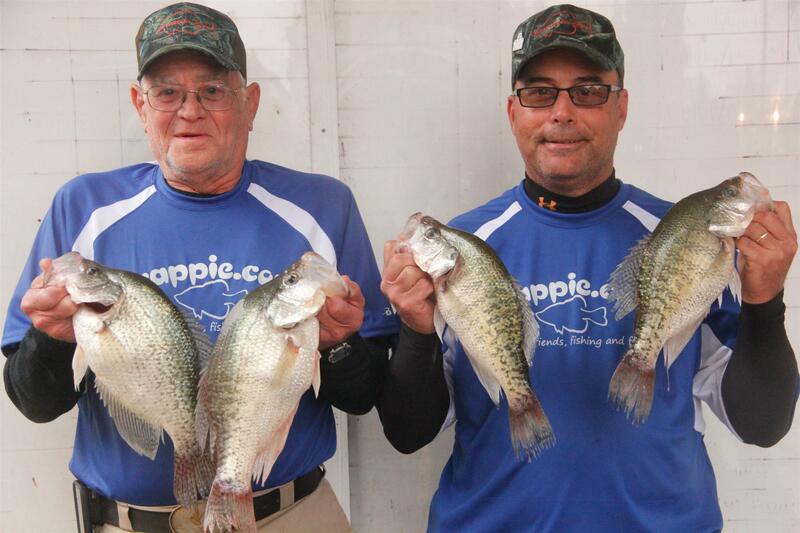 “No Way, minnows were the ticket.” Sid & Scott are great guys, and excellent crappie fishermen. I just thought Sid could only pull crank-baits, boy was I wrong. Fourth place was captured by Shelton Culpepper and David Thornton with 12.95#’s. 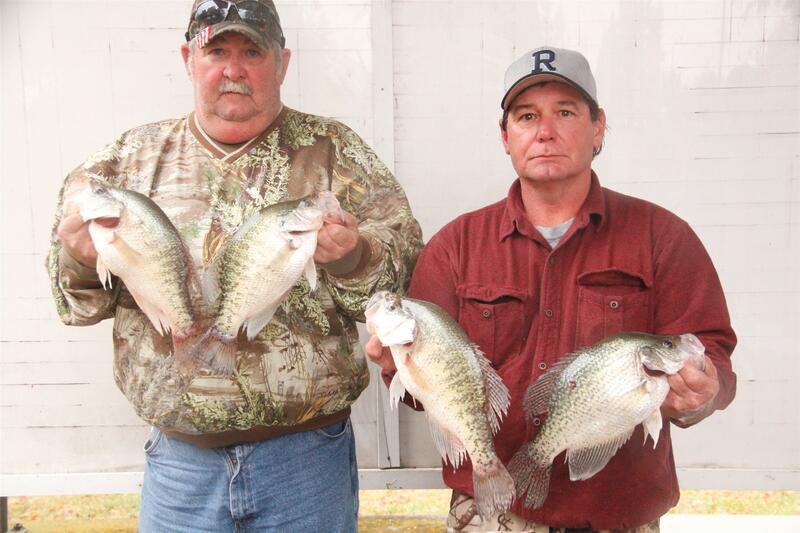 These guys hail from Eagle Lake, they’re retired now and fishing is their full-time job. I’m serious, they fish 6 days a week if the weather permits. 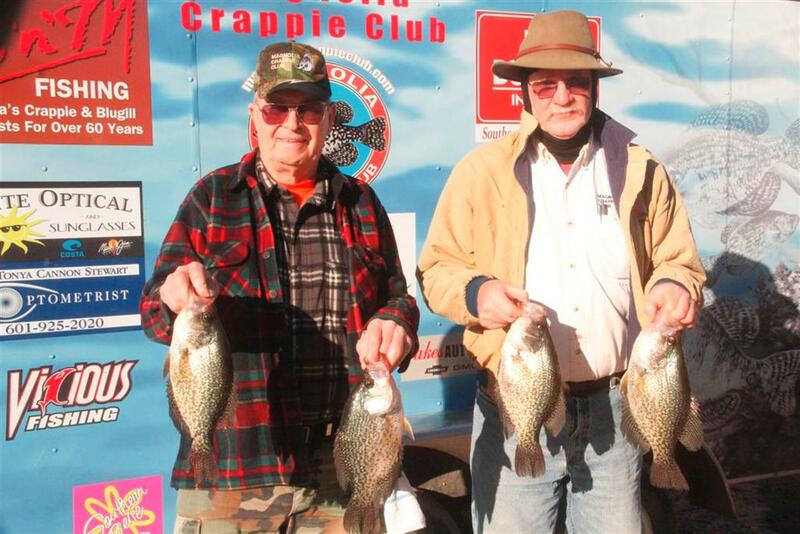 They’re long-time MCC members, and dedicated crappie fishermen. Rounding out the top 5 was the North Mississippi Rookie Team of Jeremy Aldridge & Clint Egbert with 12.37#’s. If you’ve been following our newsletter, you’ll notice that these guys are having a phenomenal year. On top of winning two MCC tournaments this year, they consistently finish in the top 10. 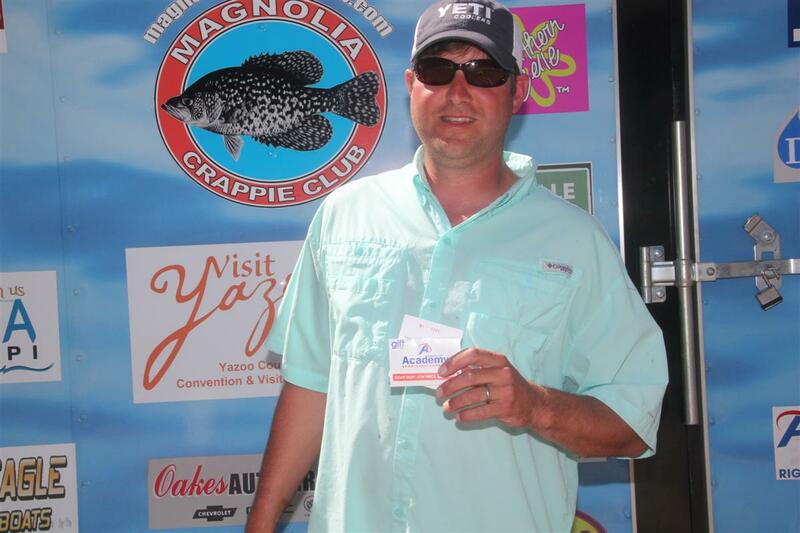 I also would like to congratulate Jeremy for finishing 3rd in the Crappie Masters Mississippi State Championship at Grenada a few weeks ago with a 2-day total of 37.81#’s. Welcome back, Charter Member Mrs. Jane Rogers. It was truly a blessing to see Ms Jane back at the weigh-in on Saturday. Thank You for the many years of service. You’ll always be one of us!!! At one time when Rabbit and Jane were fishing a tournament, most MCC teams fished for 2nd place. It was almost automatic, we knew they were going to win. Some of the rules we have on the books today are a direct result of Team Rogers. We added the 6-pole rule to compete with them, the pay-out schedule, and the points payback all because of Rabbit and Jane. We have an update on Paul Johnson’s Race-Within-A-Race, or whatever he calls it. He stated earlier that he’s beaten Team Charles Lindsay and Team Tommy Moss & Brad Calhoun 4 out of 7 times this year, well it’s tied now, 4 out of 8. Also as I look at the Point Race I see Team Lindsay in 13th place and Team Moss & Calhoun at 17th. I had to go to page two to find Johnson & Woodis at 28th. Gill, this has nothing to do with you, just your mouth-ee partner Paul. I knew when he wrote that article he was opening a can of worms and putting the jinx on him and Gill. Tommy and Charles, if I were you I would keep a copy of the points page with you at all times, when you see Paul just point to it. Well, we’re almost finished the 2013/2014 season. It’s true time flies when you’re having fun; and boy did we have some fun. We’re going to Enid next; should be some good fishing come May 3rd. I’ve seen times at Enid where you had to hide behind a tree to bait your hook; the fish were biting so good. All those 11” to 12” fish should be legal now. 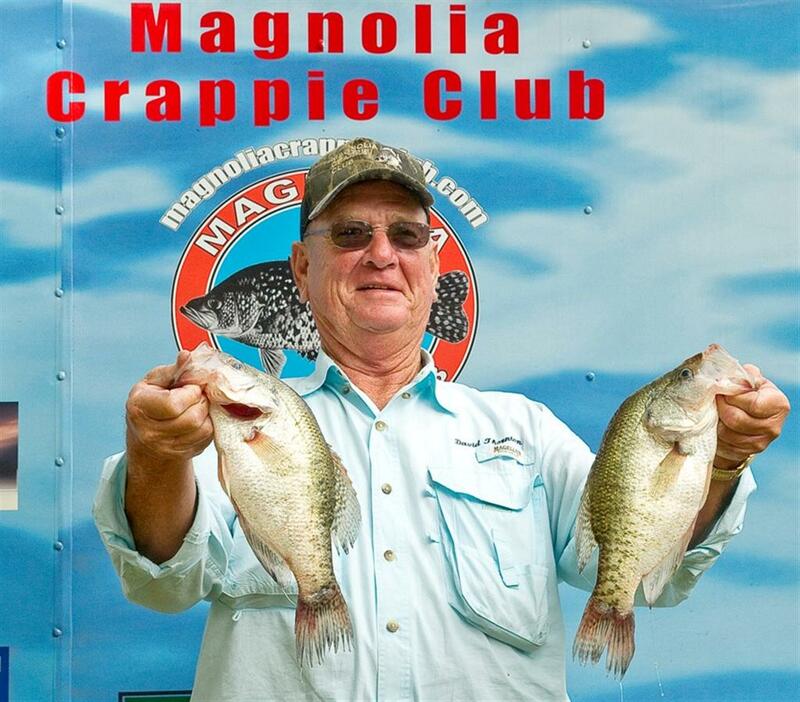 Not going to have the World’s Largest Crappie Festival this year, really don’t know what happened. We’ll weigh-in at the Water Valley Landing and then head home; gonna miss that, it was a ton of fun. Keith Sullivan & Monty Blount were 2nd with 13.51#’s. They weighed a 2.29# big fish. Excellent job guys. Congratulations!!! Scott & Sid Steen weighed 13.44#’s to finish 3rd. No Crank-baits, Guys come on, quit killing the minnows. Way to Go Guys, good job!!! Shelton Culpepper & David Thornton finished 4th with 12.95#’s. I think I took your picture at Grenada. Oh yea, I did. Good job guys. Clint Egbert & Jeremy Aldridge were 5th with 12.37#’s. They had a 2.59# Big Fish. These guys are H-O-T. Wait till next year……….. 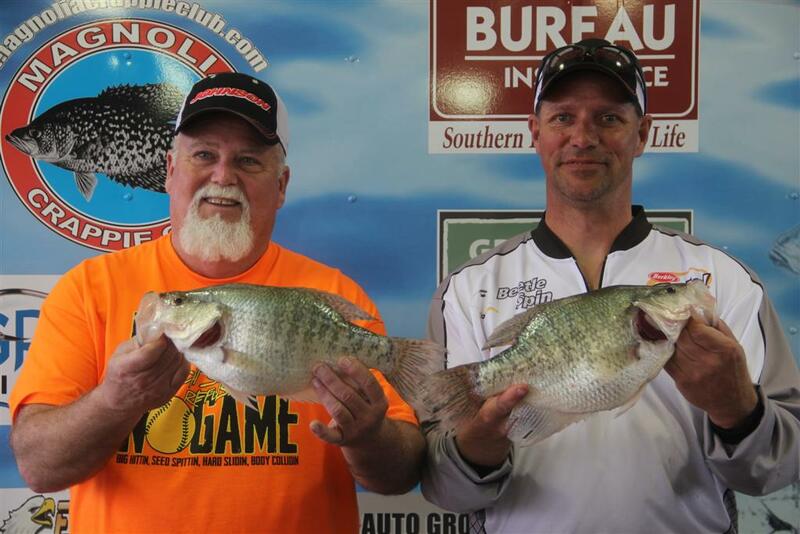 Team Lindsay won the Big Fish with a 2.74# slab. Way to go Taylor. I tried to interview Taylor, figure he would tell the truth, he wouldn’t say a word. Y’all training that boy well!!! 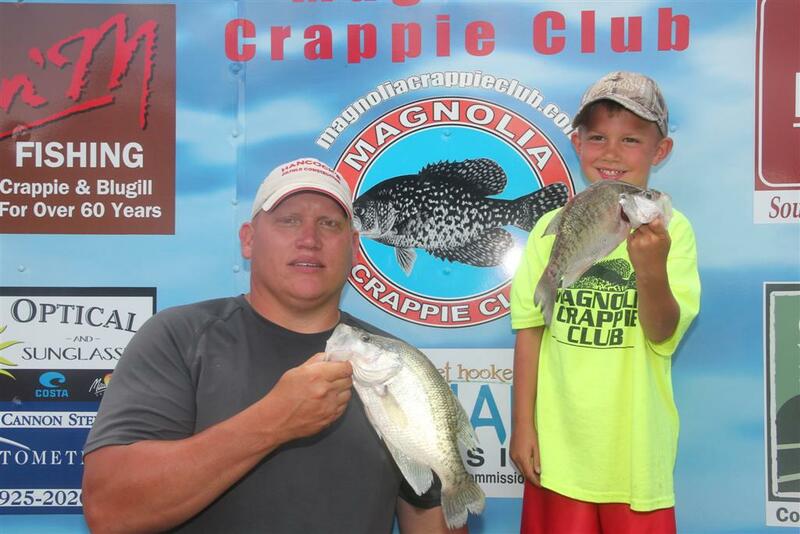 Grenada Winners Austin McDaniels & Sammy Hill with a 7-fish limit weighing 18.98#’s. It was almost a record catch. Congratulations guys this is one you’ll never forget. They had a 3.24# big fish. Is it something in the water at Grenada that makes the fish grow so big or what? Year after year the fish seem to get bigger and bigger. Where is the stopping point. I know it’s fish in this lake that would push 5#’s or better, guess the word has spread. Seems everyone knows it and that’s why you see more out-of-state tags in the parking lot than in-state. Sammy Hill & Austin McDaniels pulled out about the same time my partner and I did, we all started getting our fish ready for weigh-in. I glanced over at their boat and man, “You gotta be kidding”, they were culling fish bigger that I had. Only a couple drops of water from having 19#’s. That’s not a misprint, I said 19 pounds, and they weren’t the only ones that caught huge fish. 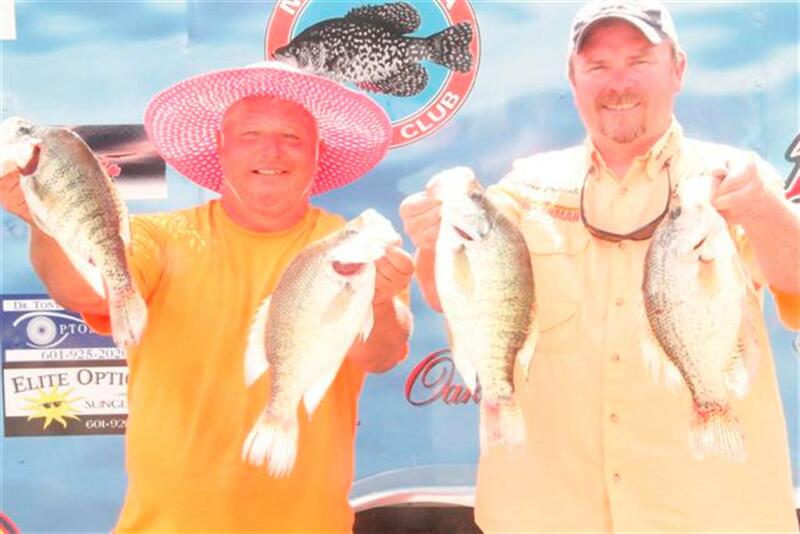 Monty Blount & Keith Sullivan had 7 fish that would have made anybody happy. Bringing 18.80#’s to the scales. Terry Steward & Larry Holmes were right behind with 18.78#’s. Roger & Katie Womack were next with 18.53#’s. Shelton Culpepper & David Thornton came in 5th with 18.30#’s. If you didn’t have 18#’s you didn’t make the top-10. If you didn’t have 17#’s you didn’t get a check at 15th place. At first I thought the scales were off, we recalibrated them two times to make sure. It was no fluke, these were monster crappie. 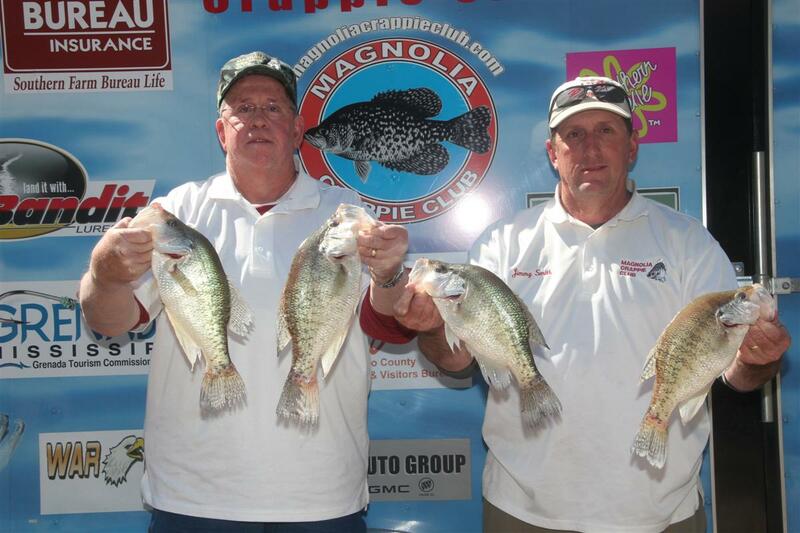 That’s one of the reasons Grenada stands at the top of the list of best crappie destinations in the world. I talked to veteran MCC member A.E. Smith Friday morning at Lakeway Bait Shop for a few minutes. He told me he had a rookie that he was training, Ronnie Capps, 7 Times National Champion. Saw him again at the weigh-in, I asked him how the rookie worked out, he said, “You give me bout a week and I’ll make a fisherman out of him.” That’s right we had Ronnie Capps fish the Grenada Tournament as a MCC Member. They did pretty good coming in with 17.25#’s to finish 14th. Not too shabby if you ask me. 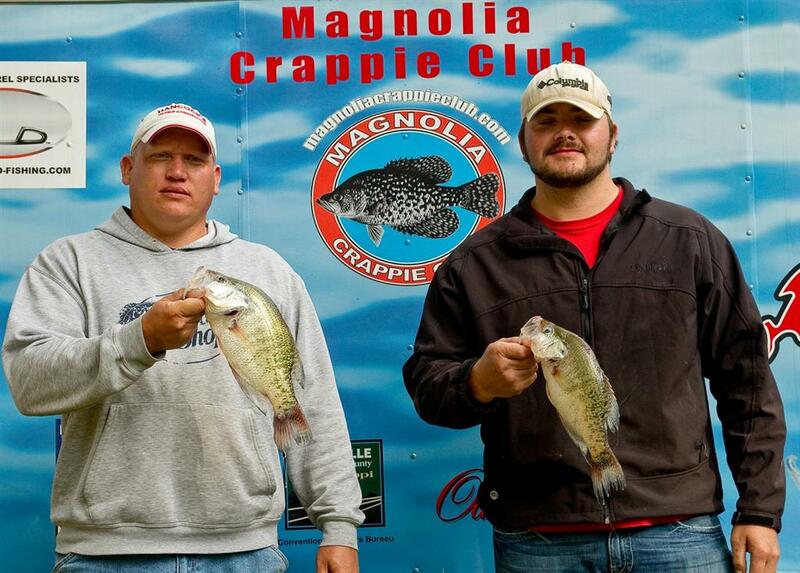 Matt Baker & Kenyon Huggins won the MCC Spring Big Mama Open with a 3.31# slab. Congratulations and way to go guys. Y’all are hooked for life. I believe these guys are a force to reckon with. I know of two teams that caught multiple 3 pounders, Terry Stewart & Larry Holmes had 2 fish over 3 pounds and a 2.99#er. Hugh Krutz & Steve Stevenson had 2 fish over 3’#s and another over 2.9#’s. I say again nothing was wrong with the scales. Most of our teams carry quality scales in their boat. They weigh their fish in the parking lot. They know what their fish will weigh before they get to the scales. Most of the teams knew they had heavy sacks. MCC invested in a scale system and software at the beginning of the 2012 / 2013 season. We got sick of the grumbling about the scales not being certified. 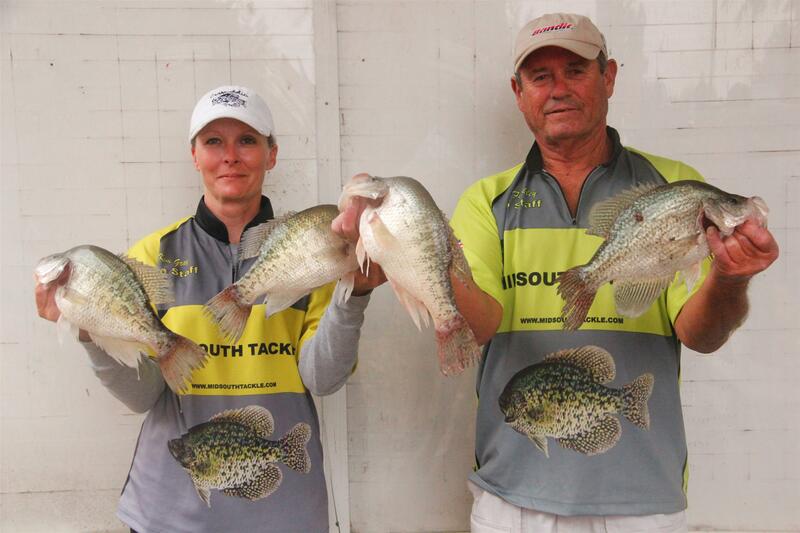 We purchased the same scales system used by the professional Bass & Crappie Tournament Trails. On top of that we have a weight that’s certified to a one-hundredth of a pound. We use it to calibrate our scales each time we start our weigh-in process. Now we have no questions or qualms about the scales not weighing correctly. Monty Blount & Keith Sullivan were 3rd with 18.80#’s. They weighed a 3.08# big fish. Excellent job guys. Congratulations!!! Terry Stewart & Larry Holmes weighed 18.76#’s to finish 3rd. They had 3 fish in the 3# class. Way to Go Guys, good job!!! 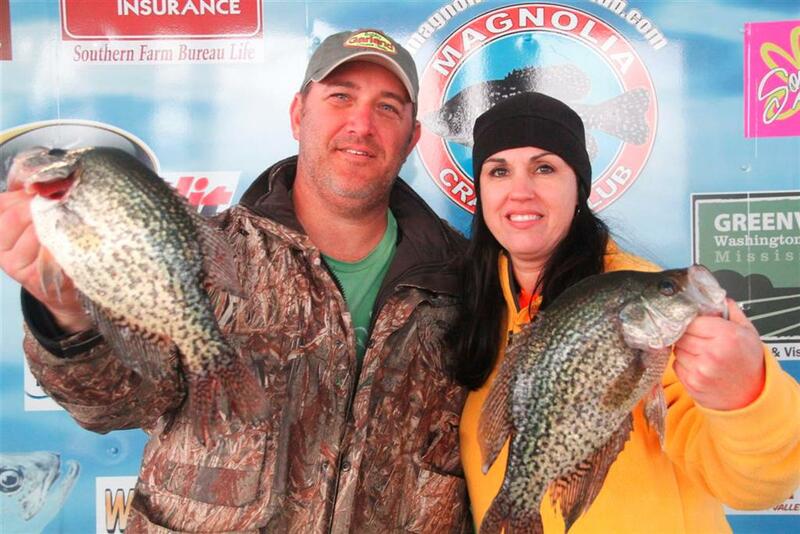 The husband wife team of Roger & Katie Womack weighed 18.53#’s at 4th place. I think Roger does better partnered with Katie. David Thornton & Shelton Culpepper finishes out the top 5 with 18.30#’s. They weighed a 3.20 big fish. Y’all know something I don’t….. Hometown partners Carl Mangrum & Brad Taylor win at Lake Washington with 16.60#’s. Now that’s almost a 2.4# per fish average. That’s awesome fish, but average for Lake Washington. Y’all ever been fishing on a day when you didn’t want the day to end? Well that’s what the fishing was like at Lake Washington on Friday and almost as good on Saturday. At one point during Friday’s pre-fishing I noticed at least 10 of the 12 boats in site netting a fish. I’m not talking about hand-sized, I talking about 2#’s or better. Huge fish, you know, the kind that look like footballs, loaded with big sacks of roe almost ready to burst. 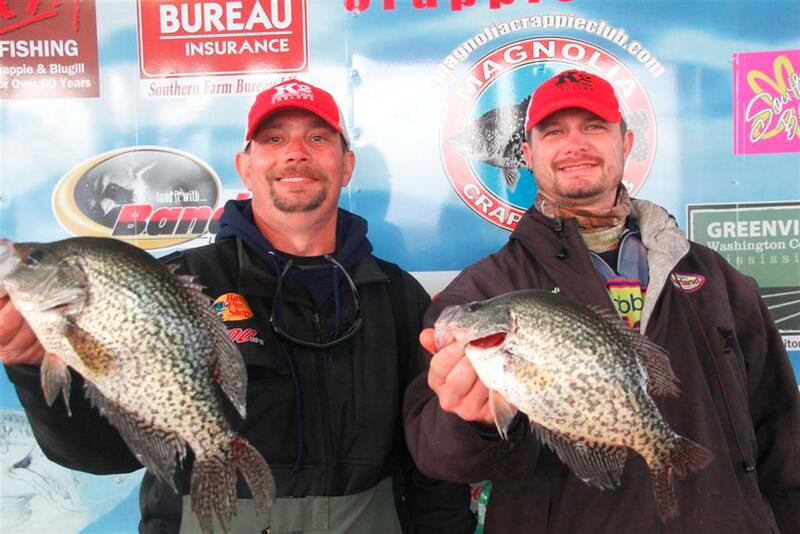 Yes, I will say, Lake Washington is my premier Crappie Lake in the country. It’s hard to beat a man on his home lake. 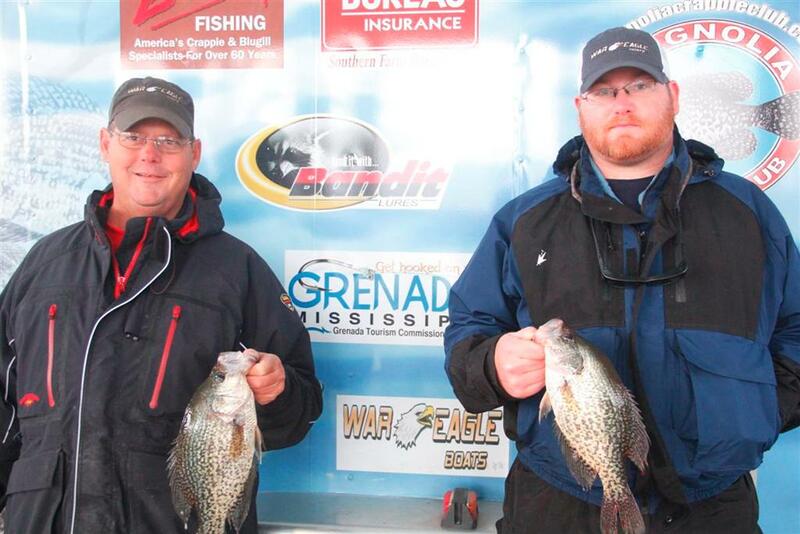 B’n’m ProStaffer Brad Taylor & Carl Mangrum proved just that on Saturday. This Greenville team meant business, bring 16.60#’s to the scales. They were on the big fish most of the day. I saw them cull fish most of us could have weighed. Brad says they found the fish Friday afternoon on the south end of the lake in a 100 yard stretch of water about 6 to 8 feet deep. They used double minnow rigs on 16’ B’n’M BGJP poles. They fished about 4’ deep with small to medium minnows, moving about .2 to .3 mph. They landed at least 20 or more fish during the day. Water temps on Friday ranged around 58 to 60 degrees, on Saturday it ranged about 53 to 56 degrees with overcast skies. The winds ranged from 8 to 12 mph most of the day. 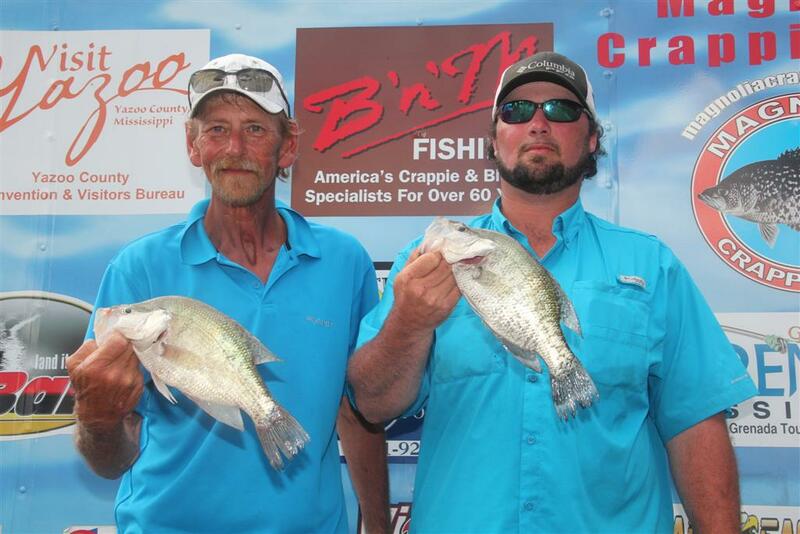 Coming in 2nd was the B’n’m ProStaff team of John Harrison and Kent Driscoll with 16.32#’s. These guys were on the water well before daylight, they quickly found the pattern for Saturday morning, the fish were about 2’ deeper than on Friday. They fished the north end of the lake in 4 to 5 feet of water, about 3’ deep. They pushed double minnows and double 1/8 jigs tipped with minnows. They quickly downsized the minnows and jigs and BAM! They were on. These guys fished in a group of about 8 to 10 boats and nobody noticed the adjustment these guys had made. Everyone else was fishing the Friday pattern, 1 to 2 feet below the surface. 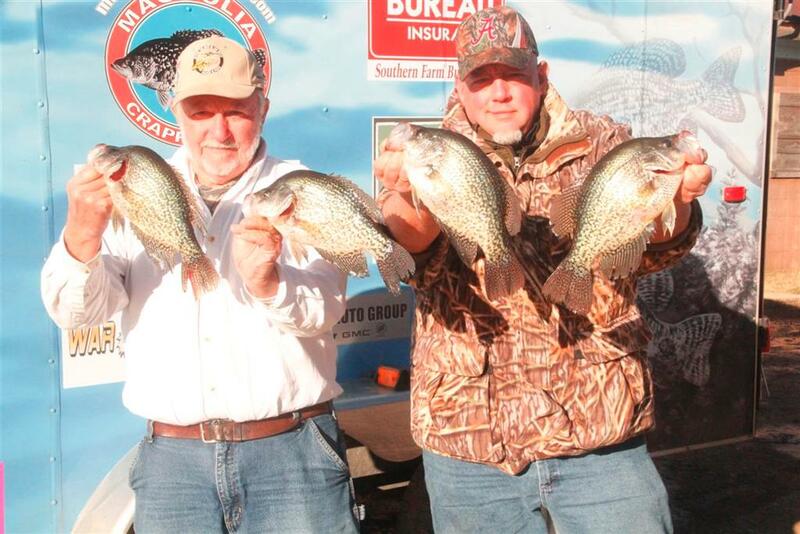 The “White Boys”, no pun intended, blew us away with a 3.17# & a 3.00# slabs. 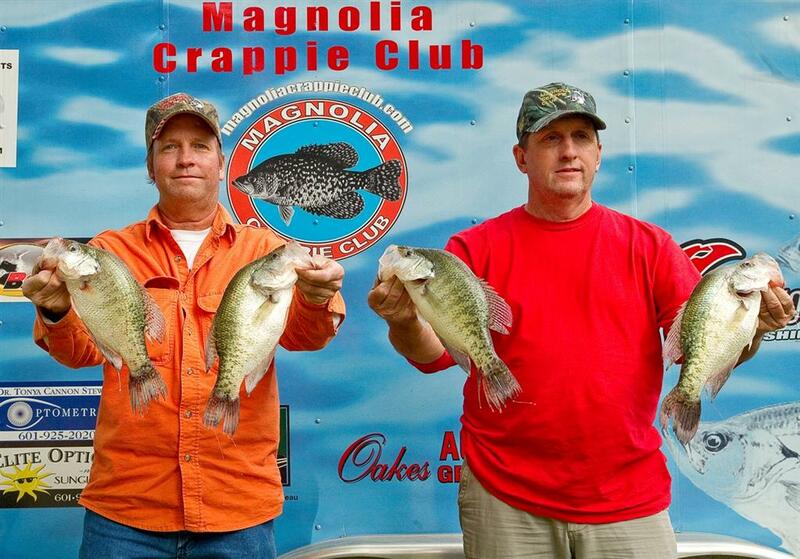 That’s right Steve & David, former Washington Winners, from Monticello AR, love fishing MCC Tournaments. David & Steve White are no amateurs when it comes to competitive fishing, they love the river lakes. David says they’re new to slow-trolling or spider-rigging. They’re long-liners strictly, no minnows, just jigs. That all changed at Washington. Steve & David, slow-trolling is not my favorite either. But when you have 50 degree water, that’s not favorable to our style of fishing. Ok, our day is coming, soon and very soon. Kent Driscoll & John Harrison (not-pictured) finished 2nd with 16.32#’s. Way to go guys. We all know y’all can fish, you proved it. Richard Sanders & William Tyer finished 3rd with 15.43#’s. Good job guys, that’s 2 top 5 finishes in the last 2 tournaments. Way to Go!!! 4th place was captured by David Thornton & Shelton Culpepper with 15.23#’s. You just can’t count these Ole-Timers out. Good Job!! Finishing out the top 5 was Matt Collier & Chaney Starnes with 15.07#’s. Way to go guys. Y’all did excellent, good job guys!!!! 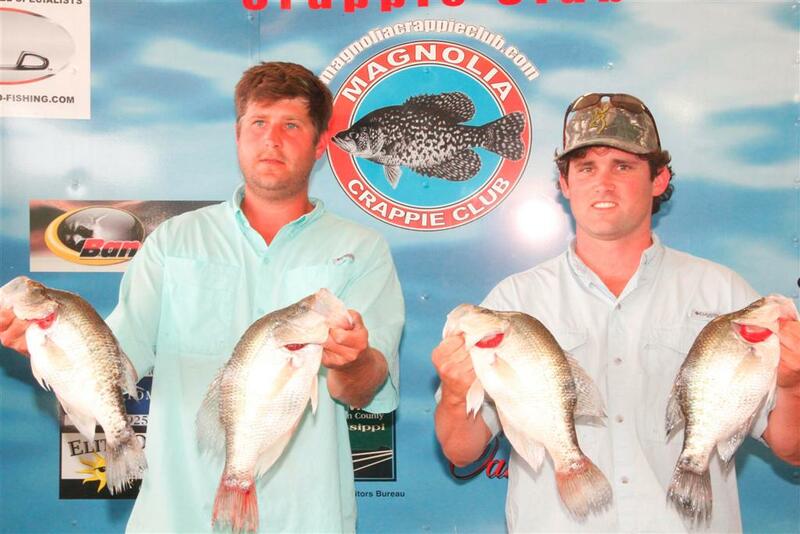 Jeremy Aldridge & partner Clint Egbert win their 2nd MCC Tournament at Chotard with 12.00#’s. This rookie team is on a hot streak and we’re soon headed up their way, Grenada & Enid. Jeremy & Clint showed us how it’s done in the winter at Chotard. 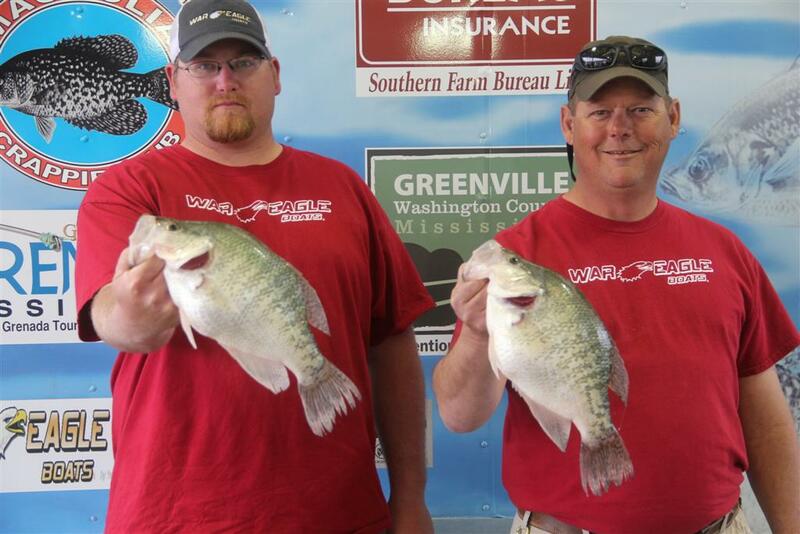 These guys caught 7 slabs on the upper end of Albermarle to beat everyone. They say their bites came while trolling minnows about 23’ at .5mph. Their hot spot along with several other top 5 teams was a small area around Dent’s Landing. The river was almost at full bank, 35’ and falling. The weather was B-Utiful for a January day. Second place went to Charles Lindsay and Charles Lindsay, Jr. with 11.29#’s. 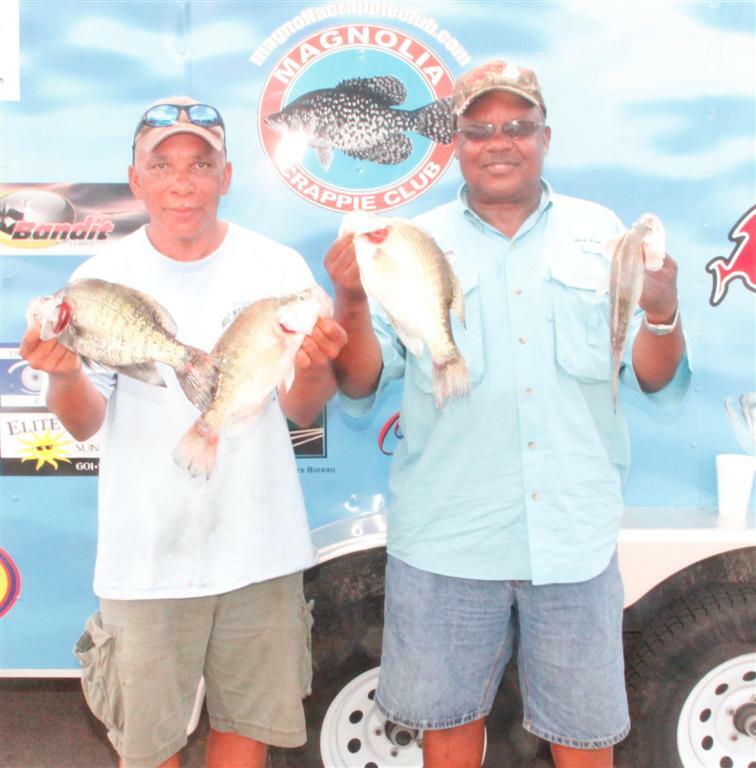 These guys also fished Albermarle, in the same location as the winners. Only difference is they need .75#’s more. They say the bite was very light, guess the 40 degree water had something to do with it. David McWilliams & Robbie Nevin finished 3rd at 11.06#’s. They were one of only 6 teams to catch 7 fish. That’s right we only caught 108 total fish for 35 teams. The fish averaged almost 1.5#’s. Our total fish weight was 158.83#’s. The average fish per team was 3, and the average weight per team was 4.39#’s. 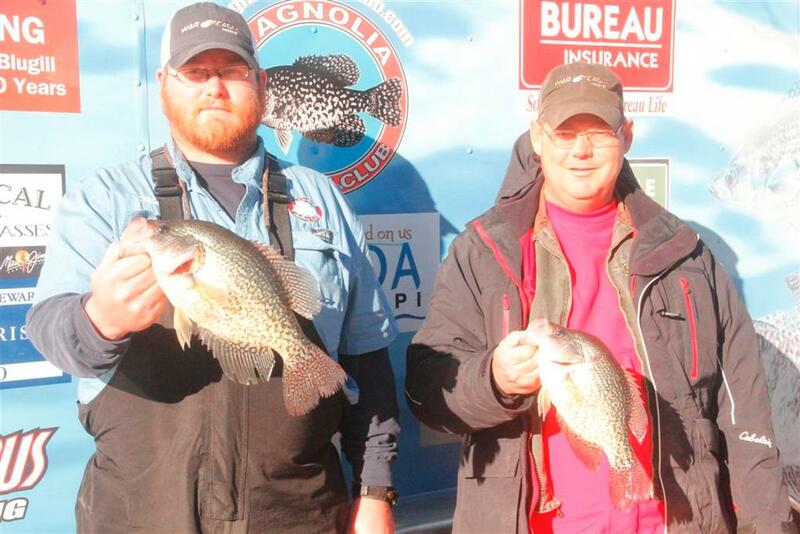 January fishing on any lake in MS is a hit-or-miss situation, for the fish and the weather. We had 2 fairly good days of practice and great weather for the tourney. Thank you Lord. Coming in 4th was Rogers & Jeffcoats with 10.18#’s. For all you guys that know this team, that’s nothing surprising. They’re hold on in the points at a strong 2nd place, just behind Harrison & Driscoll. Richard Sanders & William Tyer finished out the top 5 with 9.66#’s. I’m not sure, but I think they fished Albermarle. These guys can fish and they very seldom miss a tournament. Good job guys. This is also the area I fished. I forgot and left my net in Don’s boat. We landed 2 fish and lost 4 more real nice slabs. You just can’t pick up 2# fish with the line, especially on tournament day. That won’t work. I know it now, but hey, it’s just a game. I’ve learned to stay calm, not get worked up, and make the best out of a bad situation. That’s why they call it fishing not catching, maybe we’ll have better luck next time. 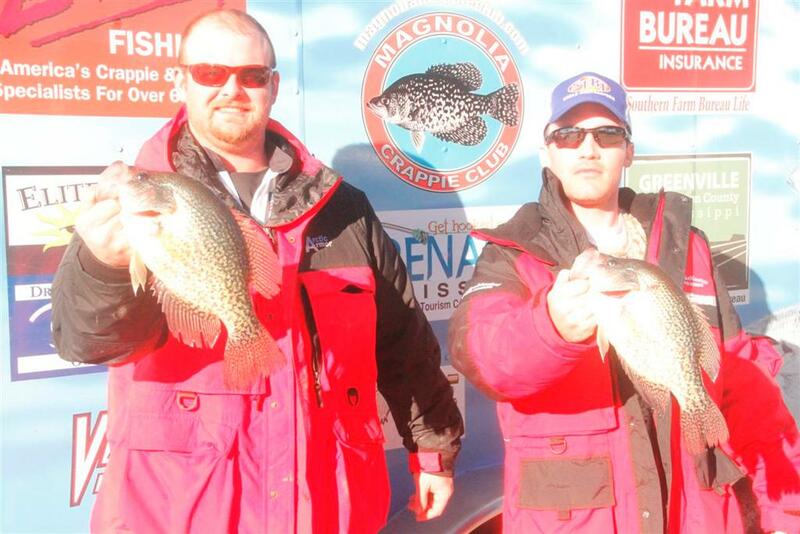 On the big fish sided, Chaney Starnes & Matt Collier weighed a 2.28# slab. 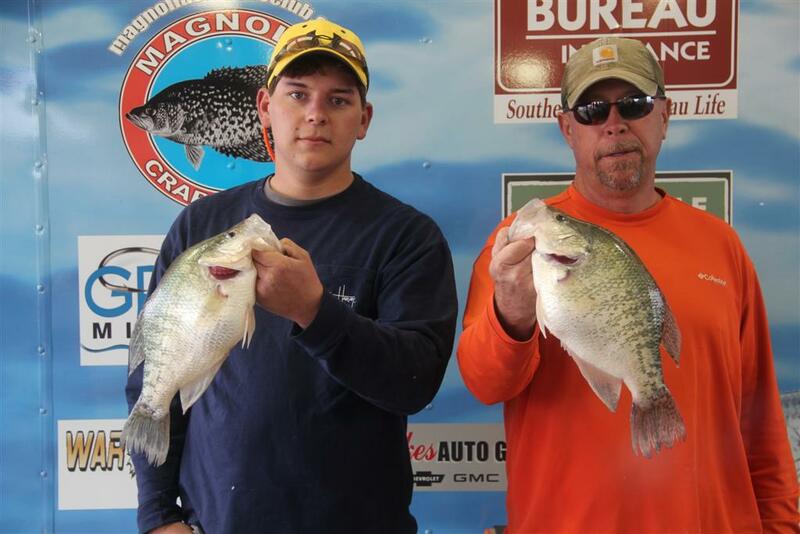 2nd place big fish went to Mason Porter & Jacob Fooshee with a 2.19# slab. Again MCC would like to thank our friends at Chotard Landing Lodge for their hospitality during our 2nd stay in less than a month. No one can make you feel at home better than Mark Johnson and his staff. If you’re ever in the area and need a place to stay don’t hesitate to stop by and get one of his fine cabin rooms. Tell them MCC sent you. We ate Deer and Duck at Friday night cook-out, and we had the leftovers for tournament day. Yes it was good. Finger Licking good. Let me tell you about some new friends I meet at Chotard. 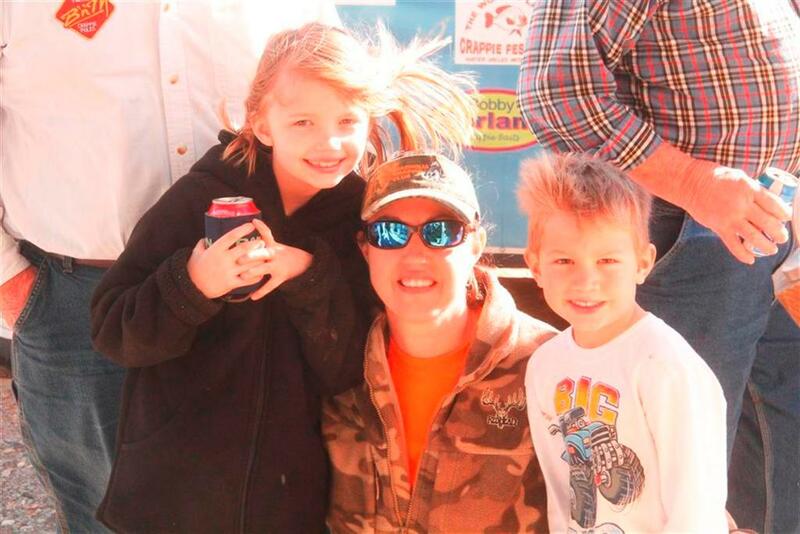 Will and Kadence Ferguson, they are the children of MCC members Dee and Lauren Ferguson. I met Will last year at Enid. These kids are the future of our club. One day, and it probably wont be long, they’ll be running the tournaments and writing the news letters. And another thing, these kids are being raised correctly, they say yes sir and no sir. Good job Dee & Lauren. Ok MCC, get ready for February on Lake Washington. Last year we broke club records for the big fish. We had a record 7 fish 3#’s or better and 12 fish over 2.75#’s. We had 39 teams, caught 149 fish that weighed 290#’s. 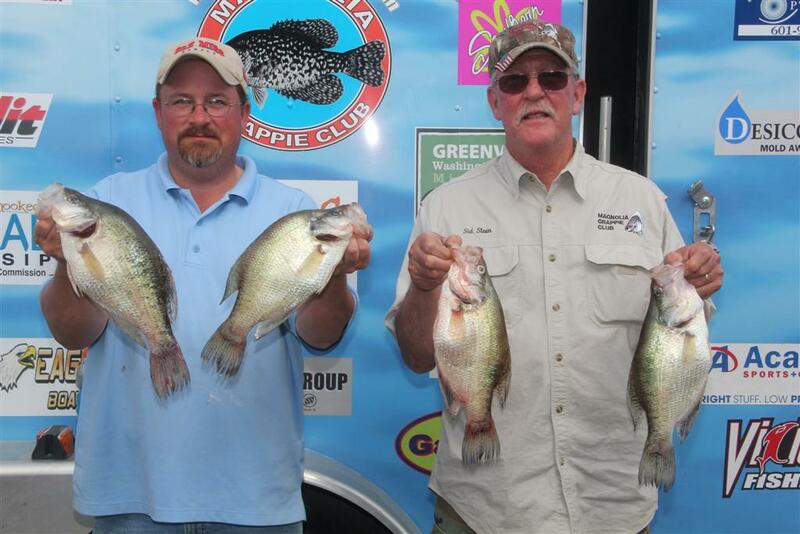 Now that’s big numbers for a small crappie club like MCC. No other tournament circuit can boast about that. It was incredible considering the weather was in the high 20’s and high wind. We plan to have a recovery tank at the weigh-in just like last year. These big sows need to spawn and we’re gonna do our best to make sure they get that chance. So please keep your fish alive. I love it when a plan comes together, our scoreboard has given us fits the last few tournaments. We now have it under control. With electronics there’s always something that acts crazy at times. I contacted the manufacture and it seems like lots of customers had the same problem. They were very helpful, they gave me a solution and it was fixed with 5 minutes. It sure makes things a lot more suspenseful seeing teams moving down the list. I keep seeing my team move down as each team weighed. After 15th place, it becomes a non issue. That’s right when you only catch 2 fish you only hope is everyone else only weigh one. Charles Lindsay & Charles Lindsay, Jr. finish 2nd with 11.29#’s. You were 2nd in the last tournament. I had very little to change. David McWilliams & Robbie Niven finish 3rd with 11.06#’s. You guys are tough to beat on these river oxbows. Good Job…………. 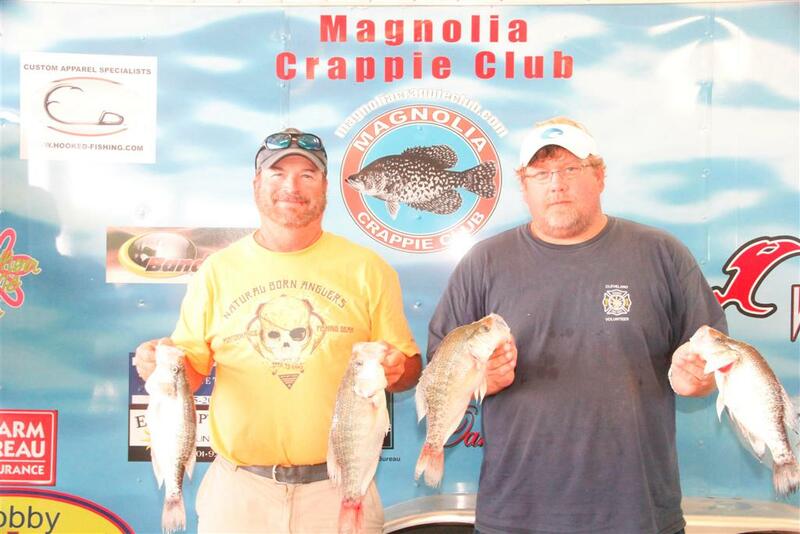 4th place was captured by Rabbit Rogers & Pat Jeffcoats with 10.18#’s. Good job guys, congratulations and all that good stuff. Finishing out the top 5 was Richard Sanders & William Tyer with 9.66#’s. Good job guys. Catching 7 fish was a feat itself. 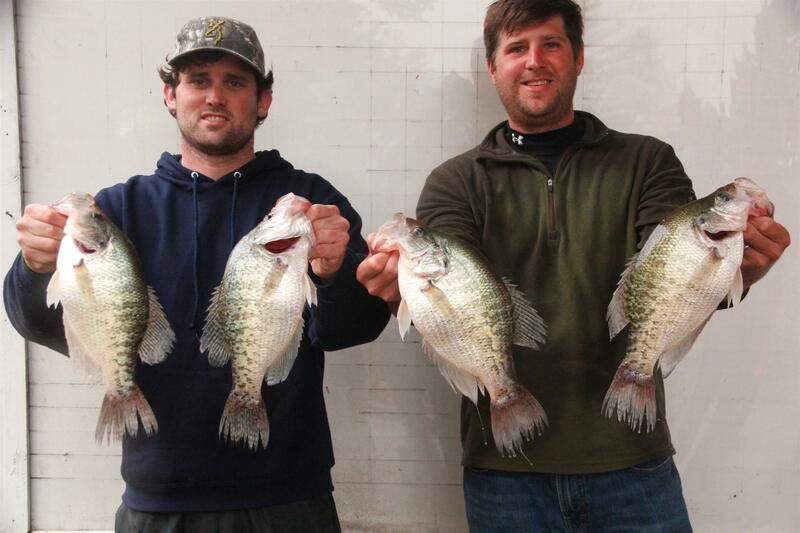 Chaney Starnes & Matt Collier with a 2.28# slab. Good job, hope you enjoyed that 4 hour drive. Jacob Fooshee & Mason Porter had the 2nd big fish at 2.19#’s. Good job guys, no practice and no sleep didn’t affect you at all. Team Kim Gray & Vic Finkley win their 1st MCC Tournament at Chotard with 13.38#’s. Gray & Finkley are becoming regular Top-5 competitors. Congratulations to both team members, Vic & Kim. 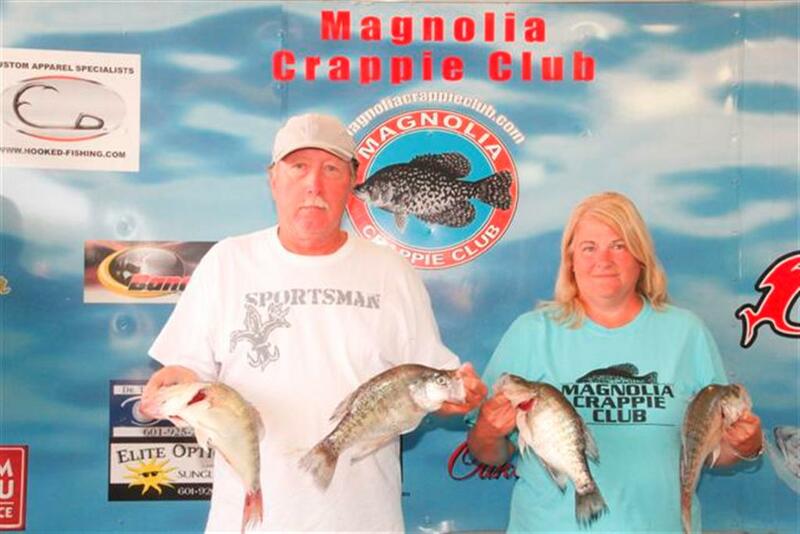 Vic Finkley & Kim Gray proved one important thing at the MCC Chotard / Eagle Lake Tournament, you don’t have to be from around Vicksburg to win at this tournament. We were betting on Shelton Culpepper & David Thornton being on the podium accepting the 1st place honors, not this time, maybe in January 2014. 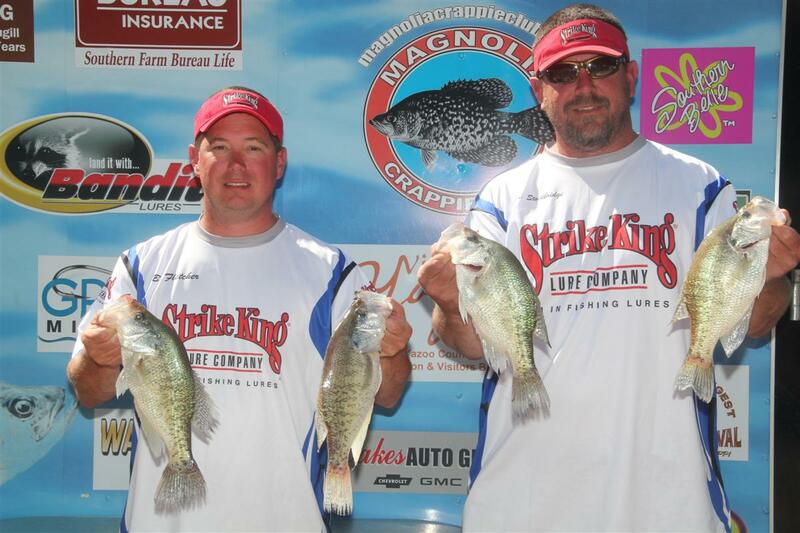 Weighing in 13.38 pounds were just enough to out-distance team Charles Lindsay & Charles Lindsay, Jr. The weather was not a factor in this tournament, the rain that came in during the late-night early morning, ended by fishing time. A very warm and foggy morning allowed most teams to get their 7-fish limit early in the morning. Most teams that I talked to said they had their fish by 8am. 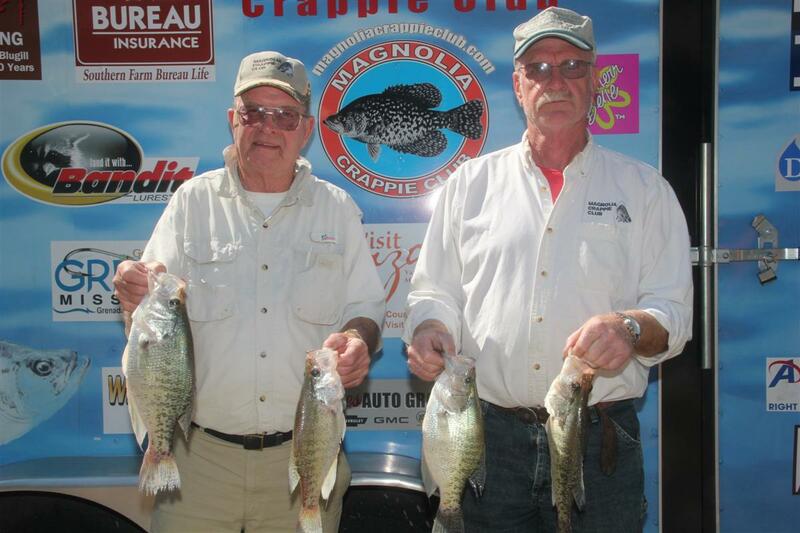 Don & I fished the deep water piers at Eagle with good results. The fish were smaller but there were catches were almost equal in numbers. 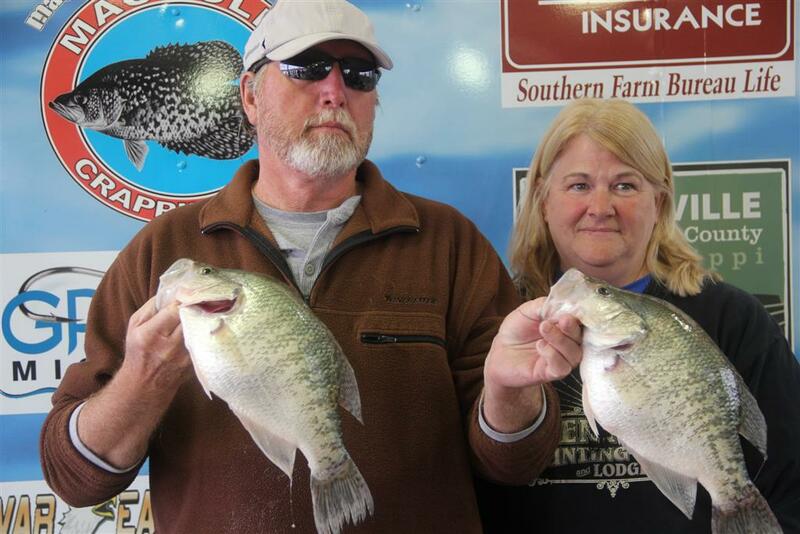 Charles Lindsay and his substitute partner Jo Jo Brown also did excellent in Albermarle, weighing in 13.17 pounds. 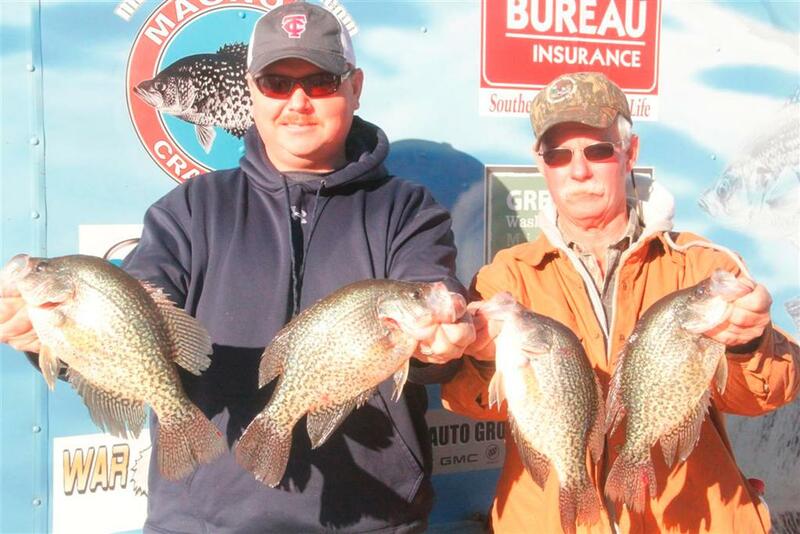 Team Lindsay has proven to be tough to beat during the winter months on the river. They put their practice and years of experience to work especially during this time of year. The husband-wife team of Greg & Ginger Ladner finished 3rd with 13.01#’s. The Ladner’s hail from the MS Gulf Coast. They have a camp around the corner from Chotard. During the winter months they spend most days fishing or hunting around the area. They are fast learners, I can remember only a few years ago when this team first began fishing this area. Way-to-Go y’all, nothing beats a wife that can out fish or out hunt your ole man. I hear Ginger can do it on a consistent basis. No I did not get this from Greg. It came from a reliable source, Brad & Bo. Chaney Starnes & Matt Collier rounded out the top-5 with 12.32#’s. This team hails from Hernando MS and they constantly finish in the money. Ok guys, what are you doing that I’m not doing, I know, catching bigger fish, no joke. MCC would like to thank our friends at Chotard Landing Lodge for their hospitality during our stay at Chotard. No one can make you feel at home better than Mark and his staff. If you’re ever in the area and need a place to stay don’t hesitate to stop by and get one of his fine cabin rooms. Tell them MCC sent you. I know I missed the Friday night cook-out, you don’t have to remind me. I was able to get a taste of pulled pork provided by Mark and staff. That’s right, they roasted a 250 pound wild hog, and boy let me tell you something, it was D-E-L-I-C-I-O-U-S.
MCC was determined as Mark was to see him get back on his feet, and boy has Chotard Lodge came back. Chotard is the only place other than Grenada, that we visit more than once a year. I can remember during the 2012 season, fishing 4 tournament days on Chotard and loving it. That’s how we roll, we make no excuses, “we put the medicine where the pain is”. Ok MCC, get ready for January, we know it’s gonna be cold. So dress suitably. We don’t need anyone getting sick and having to listen to the madam complaining about how crazy you are for going out in that kind of weather. I can say that because my better half never reads the newsletter. They will say that, I hear it all the time. It’s best not to say anything, unless you have nothing better to do than to debate a person that knows nothing about logic. Better stop at that, see you at Chotard…. Charles Lindsay & Jo Jo Brown finish 2nd with 13.17#’s. Y’all did good, you hear. Never doubted you for one minute. Excellent…..
4th place was captured by Ray Clary & Phil Kirk with 12.41#’s. Ray we missed you, glad you’re back. 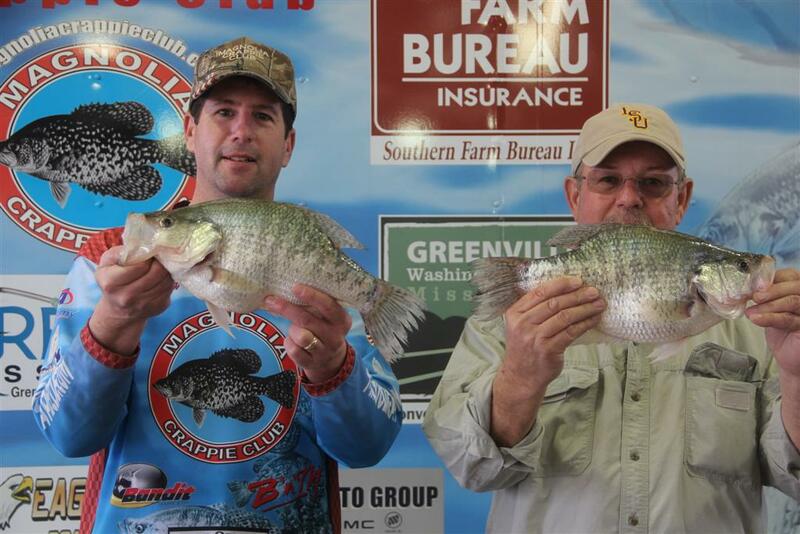 Keep up the good work…..
Brad Chappell & Bo Hudson took the Big Fish honors with a 2.18# slab. Must have been a Speck. That’s all that’s in Albermarle. Congratulations to Rusty Burroughs and Torch Tindle (13.23#’s) on their 1st MCC win. 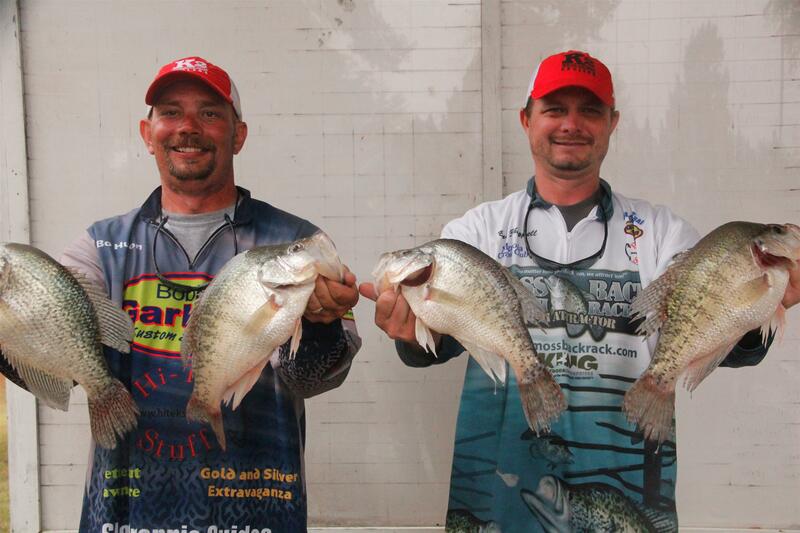 These guys showed us why they call Sardis the Big Fish Lake. I can’t say this is their home lake but they fish Sardis quite a few times during the year.…..
Ok, we’ve got 3 down and 6 to go. Sardis was no push-over, the winning teams had to earn their paychecks. On Friday we had cold windblown rain until after lunch, on Saturday the weatherman had called for 20+ mph winds, that never materialized. I must say the weather was not that bad considering it was tournament day and y’all know what that’s like. 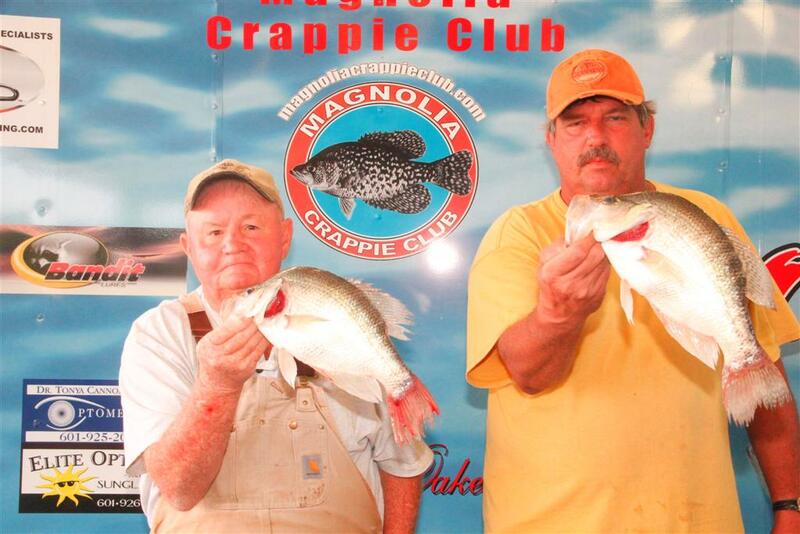 Rusty and Torch are two seasoned tournament fisherman from Cleveland, MS that began fishing with MCC a few years ago. 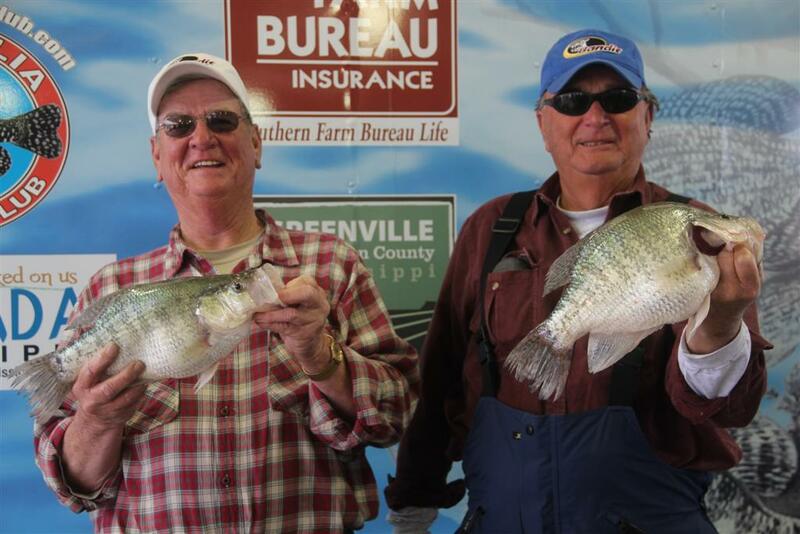 They are board members for the Crappie.com Fruit-Jar Tournament Trail. 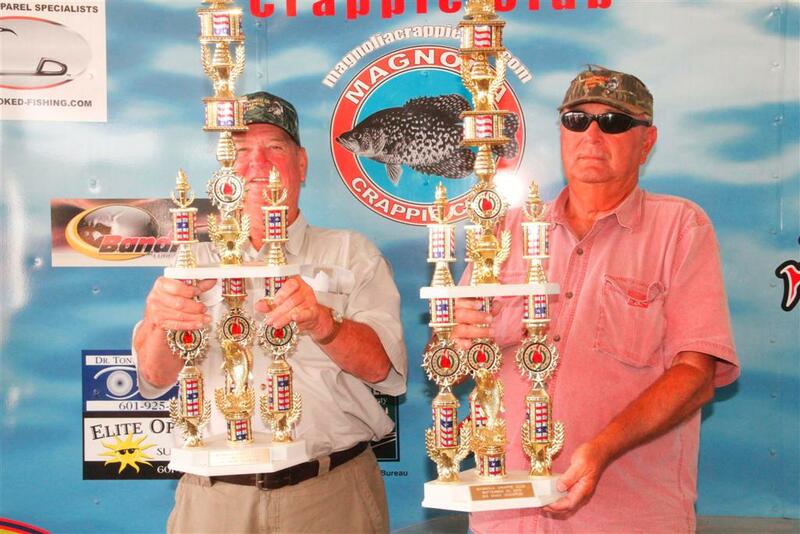 They used Rusty’s handmade horse-head jigs tipped with minnows to win the MCC Sardis Tournament. They fished a small area around Lespedeza Point all day with tremendous results. They claimed to have had their 7 fish limit before 8am. Now that’s not what Don & I encountered. We pre-fished Friday, long-lining jigs around 9’ to 11’ deep in 12’ to 18’ water with a fair amount of success. Saturday was totally different. We did not catch a fish until around noon. We finally decided to just let the wind push us across the lake, when we reached the 1.4 mph speed we started catching fish. It seems the fish were in the flats holding about 3’ deep. We quickly made our adjustments and caught our limit in the next hour. That was a relief. I’ve learned one thing in my years of tournament fishing, practice pays off, and it was never more true than at Sardis. Chris & Kevin Horton finished in 2nd place with 12.99#’s. Chris said he pre-fished Sardis for nearly a month, not counting almost every weekend all summer. Must be great to have that many fish at your back door. These guys consistently do good no matter where our tournament trail ends up. That’s always the case when you put the time in, you get good results. Brad Chappell & Bo Hudson finished a close 3rd with 12.91#’s. This is another example of practice paying big dividends. 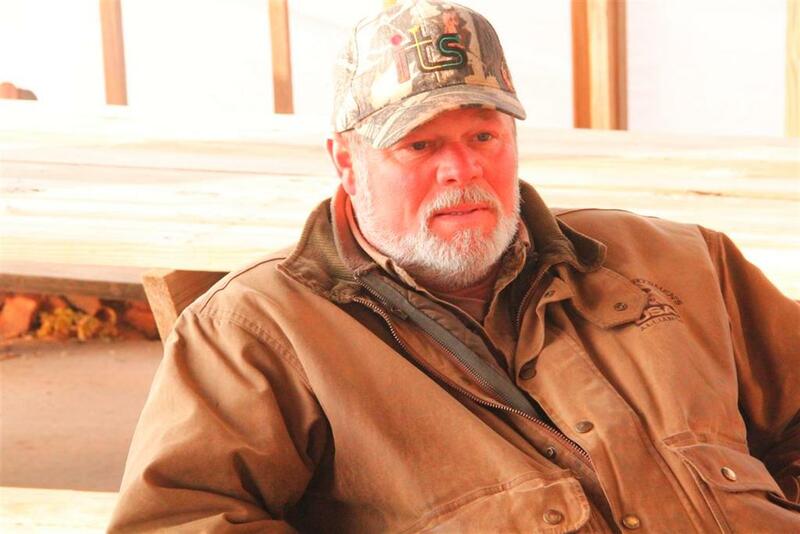 Bo fished Sardis for nearly 2 weeks. Oh, forgot to mention, Bo has a new boat. A Ranger 620 Walleye Boat and it’s B-U-Tiful. It’s designed for doing what we love most, trolling out the side and back. 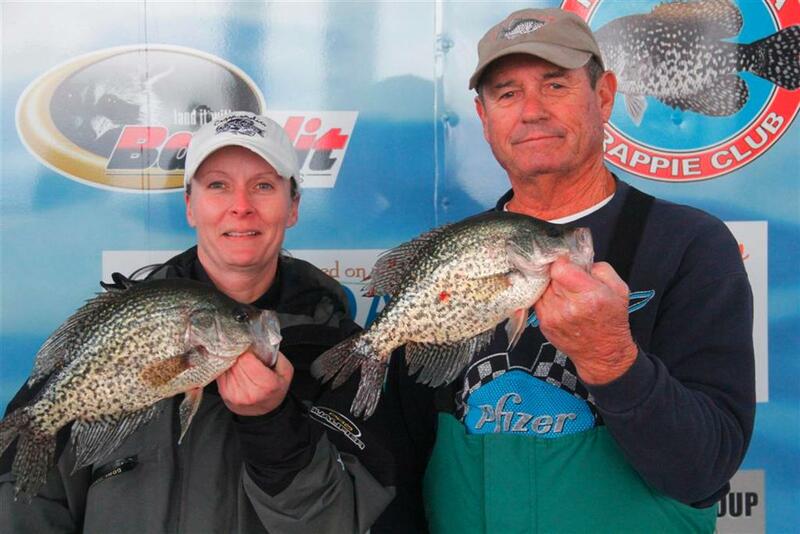 Vic Finley, Kim Gray & Coco the Crappie Dog was 4th with 12.87#’s. 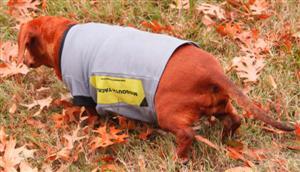 And yes, Coco has a tournament shirt too. Jeremy Aldridge & Clint Egbert / Jerry Gross & Jay Carr tied to finished out the top 5 with 12.15#’s. Y’all remember Jeremy & Clint from Grenada. 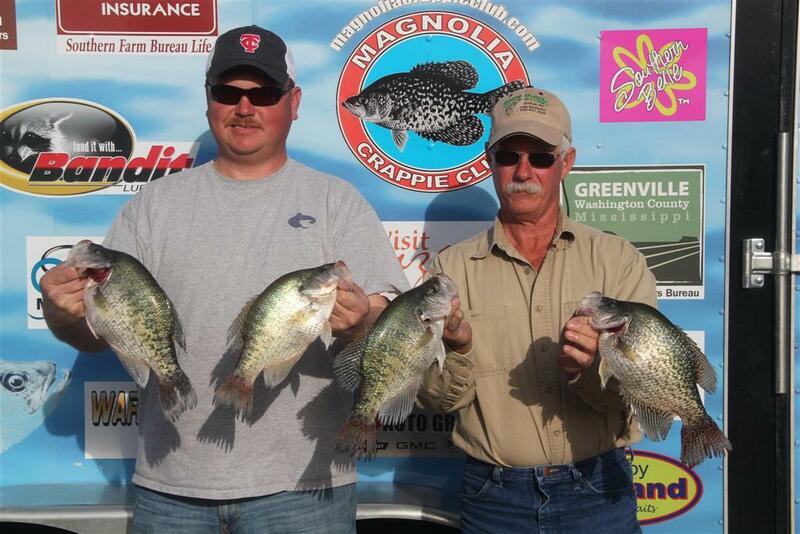 I hear they won the crappie.com tournament a week before. I realized one important thing, nearly all the top 10 stringers came from the same place in the lake. The fish were stacked in this area and will be for the next 4 or 5 months. So if you go to Sardis, don’t go too far from Lespedeza Point. The fish are there and they will bite. 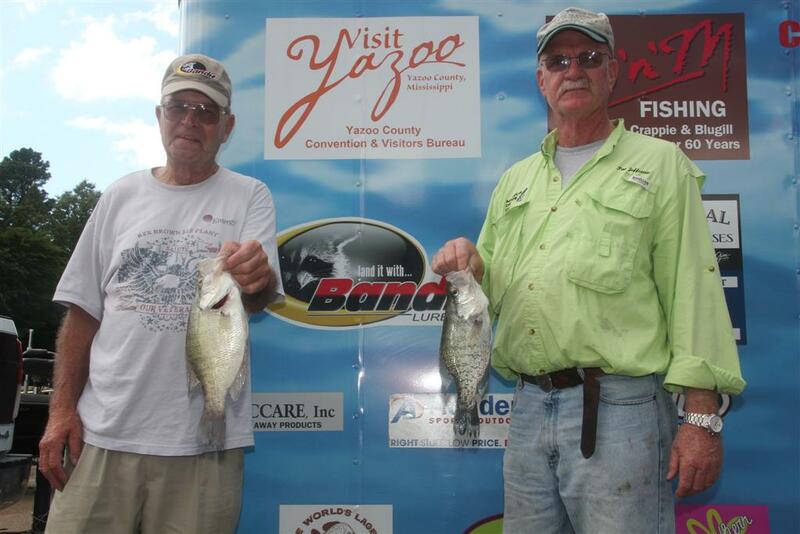 Brad & Bo reported catching nearly 40 or more fish. Most were tournament sized fish. I’ve got to tell you guys about a super nice guy I met at Sardis, Kenyon Huggins, y’all probably know him as Handicrappie on crappie.com. He fished with Chaney Starnes & Matt Collier. This is what MCC is all about. The MCC Board of Directors gave him a 3rd person boat pass for life. Meaning, he can be the 3rd person in the boat with any MCC Team. This guy has a superb personality and attitude. Hey Kenyon, ain't no stopping you buddy, you can fish with me anytime. We had another 1st happen at Sardis, Brad & Melody Taylor’s 7-year-old daughter Allie Bree’ caught her 1st fish and boy was it a whopper (2.78#’s), now that’s in the fall, just imagine what that sow would weigh in the late spring. Allie Bree’ said she landed the fish all by her self, she stated that she could use a better net man. She said they would have won had her dad not miss so many fish. 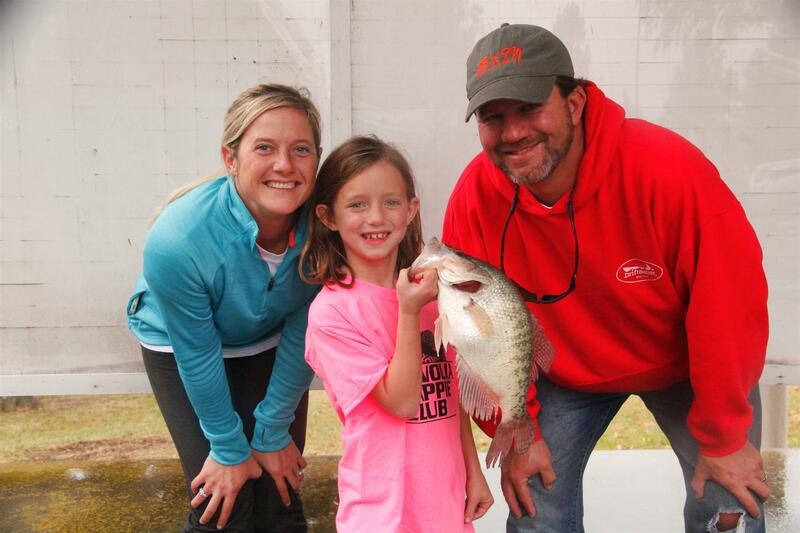 Brad, I think you got a future world champion crappie fisher-woman on you hands. Way to go Allie Bree’, we know you’re hooked now, so we’ll see you at Eagle Lake. And yes, she knows how to pick up the winnings. 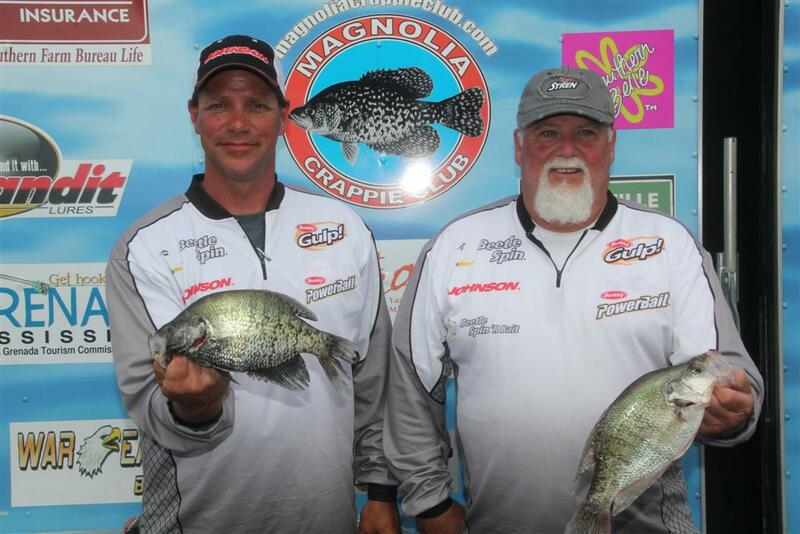 Chris & Kevin Horton finished 2nd with 12.99#’s to make it a 1st & 2nd for Cleveland, MS. Both teams hail from this town. Good Job. Bo Hudson & Brad Chappell finished 3rd with 12.91#’s. Great to see guys from down south compete with these Yankees. 4th place was captured by Kim Gray and Vic Finkley with 12.87#’s. Hey Vic, that lady can really fish. Where’s Coco? I know she’s mad. 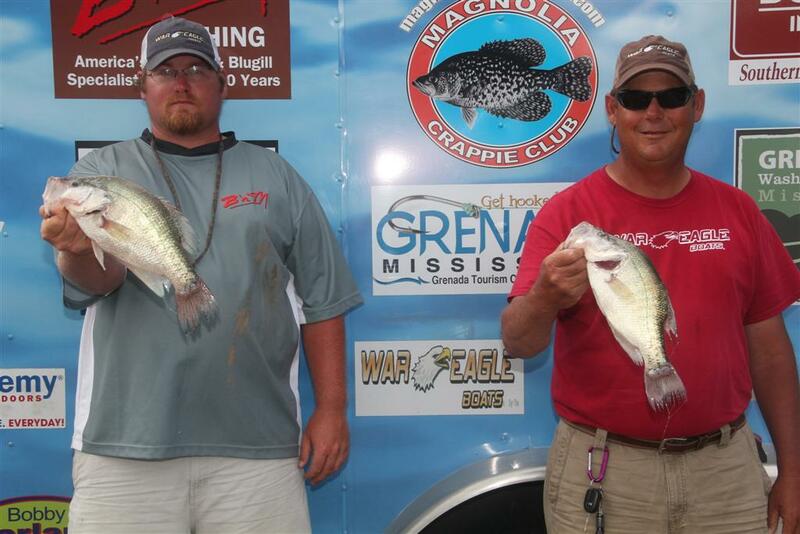 5th Place Tie - Jerry Gross / Jay Carr with 12.15#s. Good Job Guys, Congratulations. 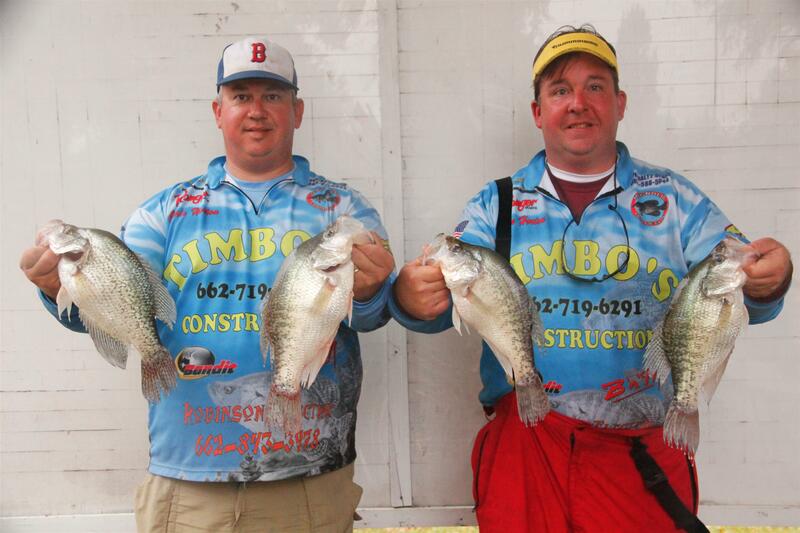 5th Place Tie - Clint Egbert / Jeremy Aldridge with 12.15#s. Good Job Guys, Congratulations. 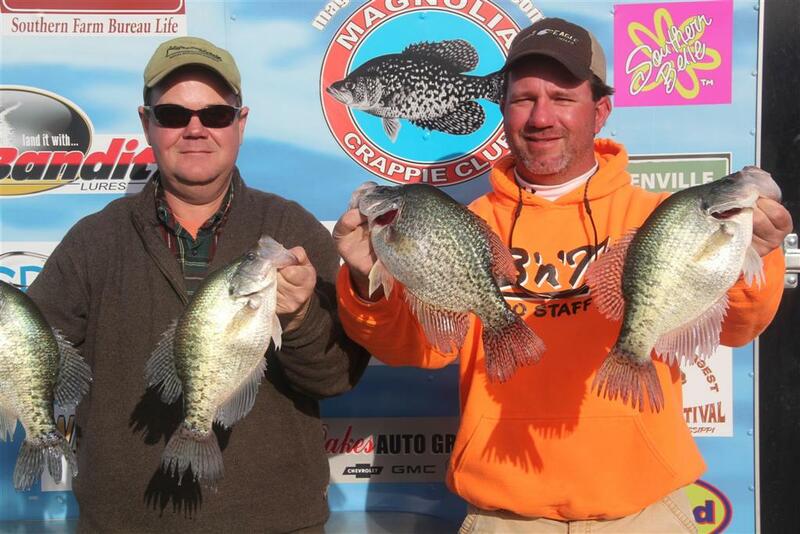 2nd Place - Big Fish - Tie - 2.42#’s - Brad Calhoun / Tommy Moss - Way to go MCC………. 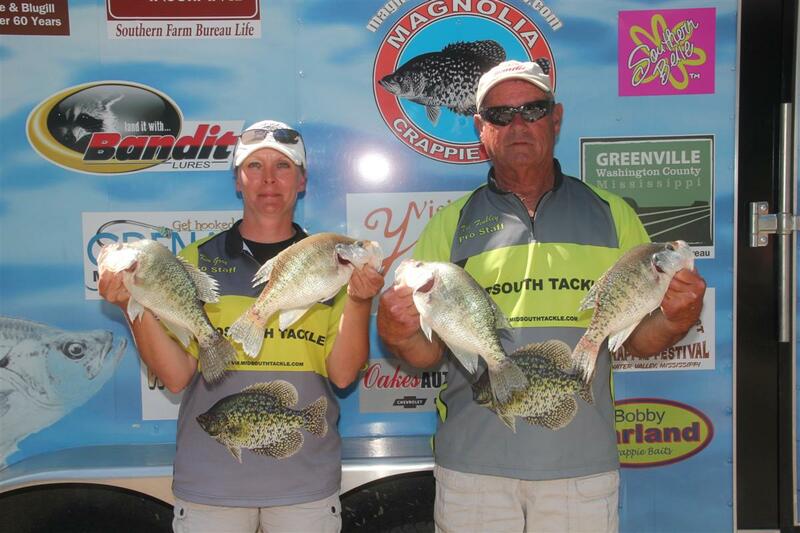 2nd Place - Big Fish - Tie - 2.42#’s - Terry & Tonya Stewart - Way to go MCC………. Congratulations to Dee Ferguson and Cory Smith on their 1st MCC win. Wolf Lake presented some challenges and these guys stood the test. They had the winning stringer and the Big Fish of the tournament. Way to Go Guys…..
It’s happened for two (2) tournaments in a row, new teams coming out on top. Wolf was no different, Dee Ferguson and Cory Smith are a brand-new team with MCC. Dee has fished with us off and on last year but his work schedule forced him to miss quite a few last year, but he said this year is gonna be different, and boy was he right. 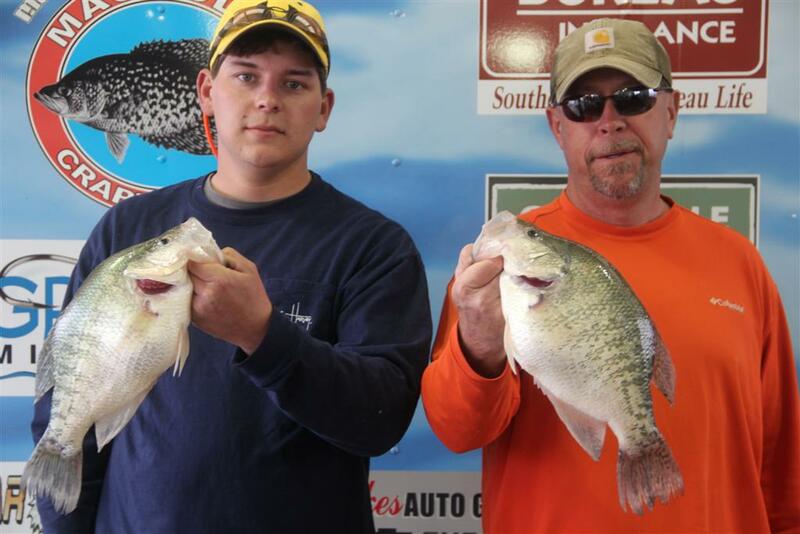 Dee and Cory were the only team to break the 8 pound mark and the 1.78 pound slab took home the big fish money. Dee said they started out slow trolling early morning around mid-lake. After they caught their 7 weigh-in fish, they switched to long-lining. Now this is Dee’s favorite technique. I saw him all spring and summer perfecting his skills on Barnett. Dee stated that he had caught bigger fish long-lining and he wanted to make sure he had 7 fish before he broke out the long-lining rods. Cory wanted to go sit in a deer stand that morning, it didn’t take too much convincing from Dee to change his mind. Cory it paid off this time, I just wish you had gone deer hunting. It would have been much easier on the rest of us. Coming in at number 2 was the team of Monty Blount and Keith Sullivan with 7.92#’s. These guys are hard to beat on Wolf Lake. They’ve fished this lake for years and it seems that they know where the good fish are and how to catch them. Monty and Keith are great fishermen and great guys. 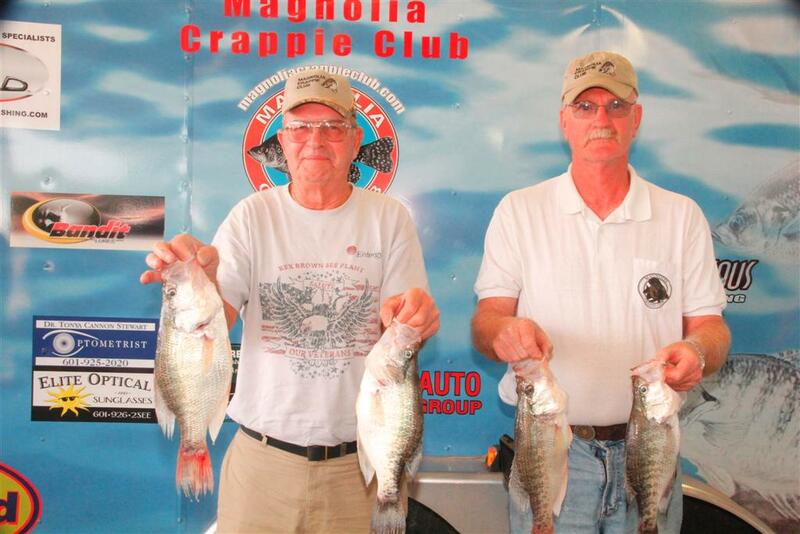 They love crappie fishing and they’re great MCC members. 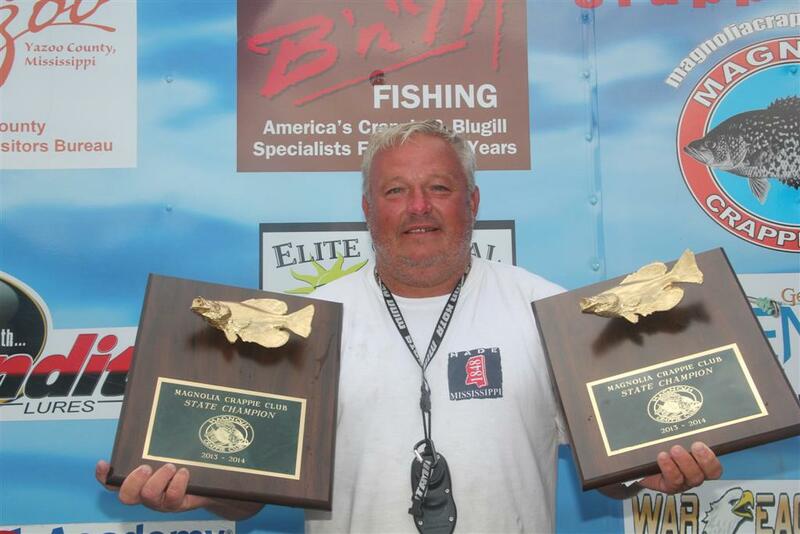 Placing 3rd was David Thornton fishing alone. Normally Shelton Culpepper fishes with David. We’re sorry to hear that Shelton had surgery due to a fall in his boat, but we’re glad to hear he’s recovering quite well. These guys are on another hot-streak, I’ve seen it in the past. No stopping these guys when the luck is on their side. David’s 7 fish came in at 7.84 and his big fish put him in 2nd place at 1.74#’s. Well David, did you split the pot with Shelton? I don’t think he would take it. Coming in 4th was the Smith Brothers at 7.70#’s. These guys can catch fish wherever we fish. My only question is, “How many brothers do y’all have?” I know Jimmy, Ricky, Johnny, and Jimmy L., who did I miss? Finishing out the top 5 was local guys, David McWilliams and Robbie Nevin at 7.26#’s. I told David that this should have been their win, but we all know that it’s hard for someone to win on their home lake. These guys are tough on any lake they fish, not just Wolf. Good job guys. I knew Wolf would be tough, all the reports were poor catches with lots and lots of gar. I also knew the MCC bunch would figure a way to find and catch good fish. And that’s exactly what they did. I saw some beautiful crappie come out of this lake. It won’t be long before Wolf is back to it’s days of old. A good spawn here and there and a little bit of re-stocking from our friends at MWFP would bring this lake back to it’s 70’s and 80’s level. On another note, MCC started the year with a whole new board of directors and new officers. I must commend our new tournament director, secretary / treasurer and weigh-master for an outstanding and dedicated job. Ken is in his 2nd year as president and I must say he’s doing a tremendous job promoting MCC. That’s what it’s all about. This club is bigger than one or two people. It took a lot of people working together to get us where we are today. We thank all of you that had a hand in forming and organizing this great club. Your effort and dedication is paying great dividends. We still need your help. 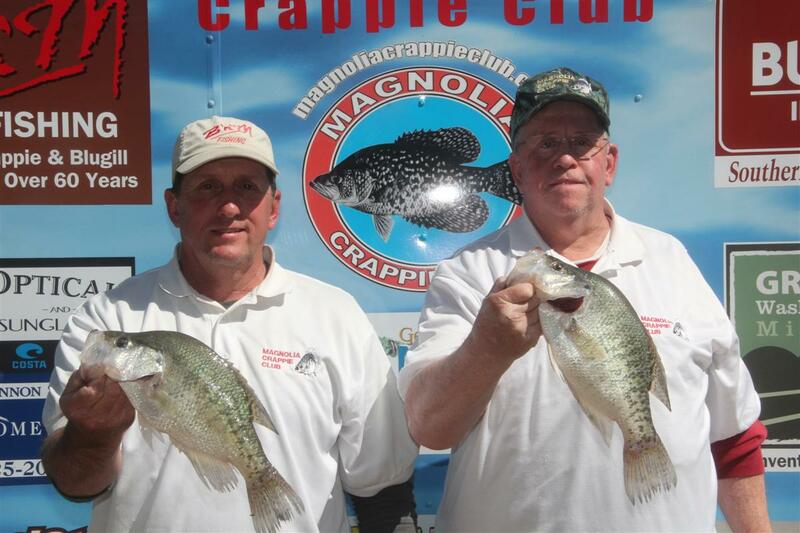 Please continue to help and support our efforts to make this the best crappie club in the country. If you didn’t know it or not, we are the talk of the town. I’ve notice something we need to address, our smaller sponsorships have declined drastically. We need to press our efforts for more of the $150 - $275 sponsorships. This used to be the bread and butter of our club finances. If each team could solicit just one sponsorship in that range, it would push our championship payout back to levels seen in the early 90’s. We’ve tried numerous fund raisers (Splash-4-Cash & BMO). They’re all fine and dandy, but the low-level sponsorships are our ticket to a big championship payout. Here’s an idea, most guide trips costs between $300 - $400 per day for 2 people. If we could take 1 or 2 Saturdays during the spawn and each team do a MCC Sponsored Guide Trip with the money going to MCC for the finals, it would put us back to the big championship payouts that we were at in the past. 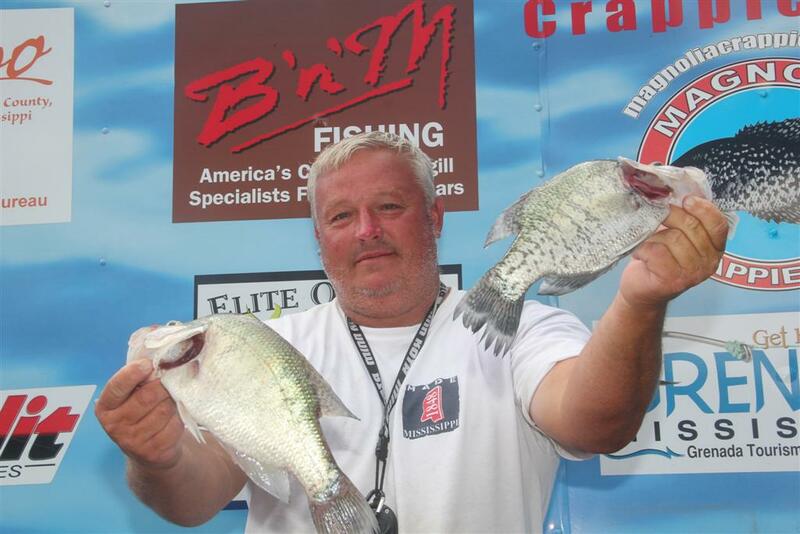 We all love crappie fishing, so do lots of people that don’t own boats. We have the knowledge and know-how. Let’s make it work for us and the club. If not a whole day, a half day would do. Finally, I would like to thank everyone for the support we’ve received from our big Exclusive Event Sponsors, . Everyone that worked hard to get these sponsors, I say from all the members of MCC, Thank You. We appreciate each and everyone of you and the work you put in to solicit these companies and organizations. We will do everything possible to show our appreciation for their support. David Thornton finished 3rd with 7.84’#s. So we know who’s been catching the fish. Shelton, you better get well soon…………. 4th place was captured by Jimmy L. Smith and Jimmy Smith with 7.70#’s. These guys say they ain’t no kin, I don’t believe that. Home-boys David McWilliams & Robbie Nivens finished 5th with 7.26#’s. These guys are always tough to beat on any lake. 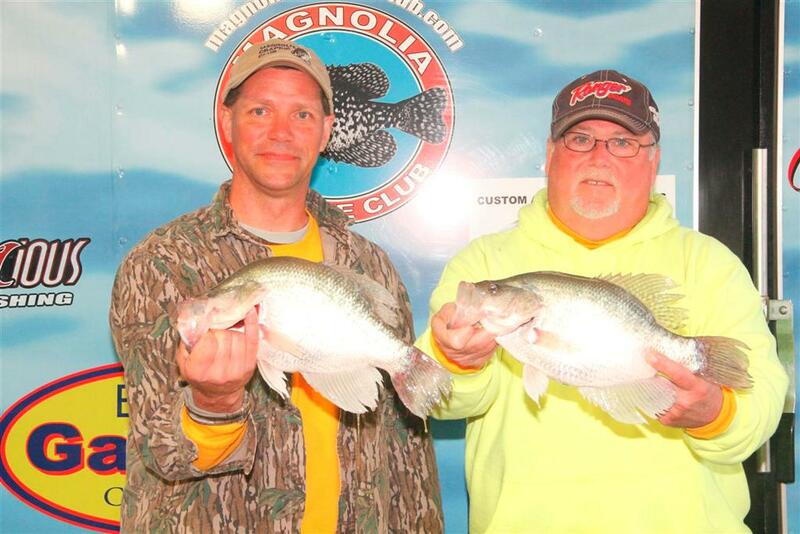 …..
Jeremy Aldridge & Clint Egbert on winning our Grenada Club Tournament with a 7 fish limit totaling 12.34#’s. 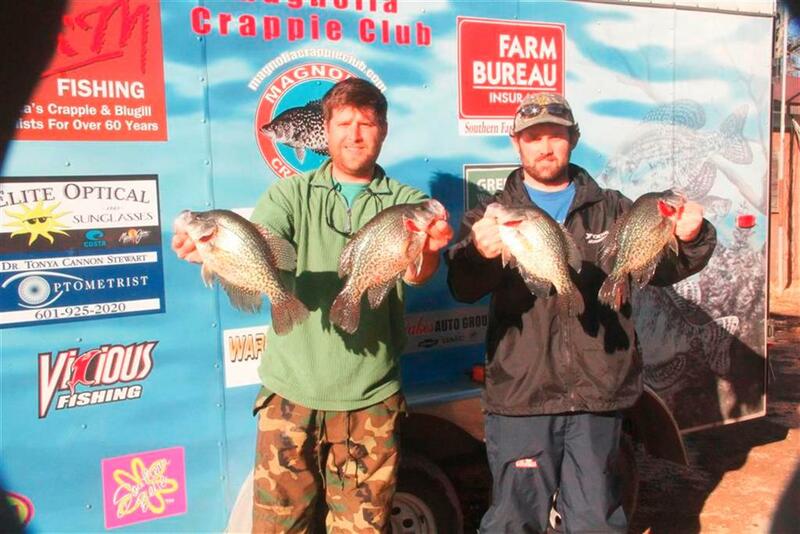 This was the 1st time these guys ever fished a tournament and 1st time with MCC. 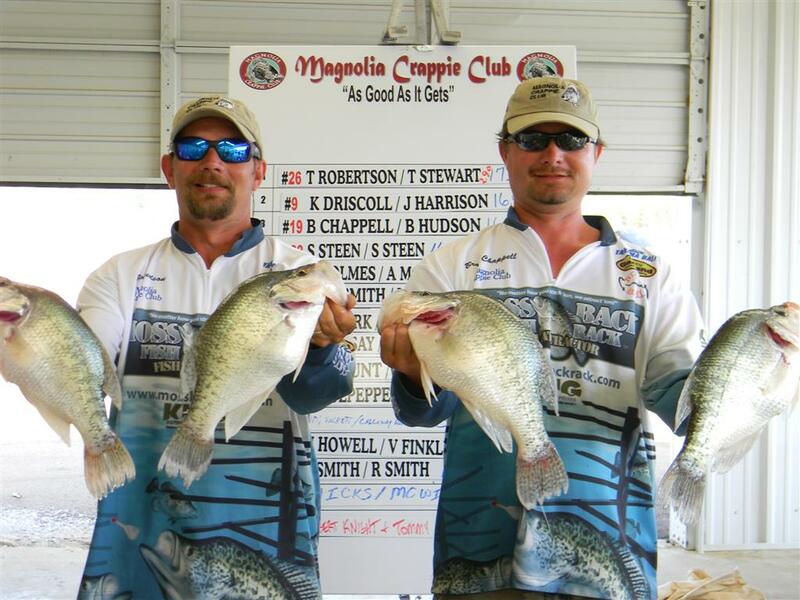 Y’all Hooked Now…..
Jeremy Aldridge & Clint Egbert were the hands down winners of the MCC Grenada Club tournament with 12.35#’s. 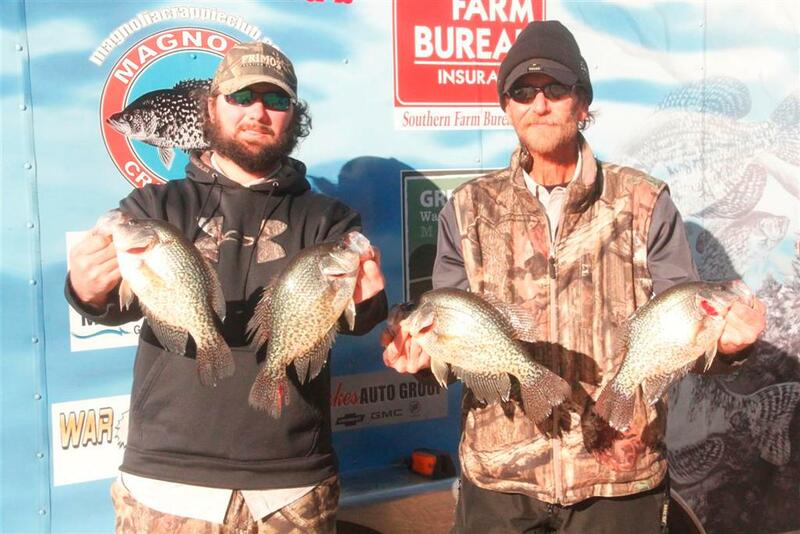 These guys were 1 of 3 teams to weigh in a limit of fish. Most teams caught 0, 1, 2, or 3 fish. I think most teams didn’t catch a fish. It was no fault or reflection on the fishermen and women. The fish just didn’t want to bite. Most teams caught their fish during the 1st hour of the tournament, including me. 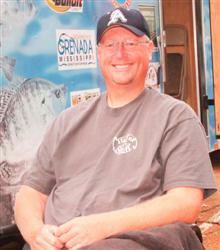 Jeremy stated that he found some good fish on Friday during pre-fishing around Carver Point. Saturday morning he and Clint returned and the fish were exactly where they were the day before. They slow-trolled minnows just off the bottom in 11’ to 13’ feet water. The bit was very slow. They caught 6 fish the 1st 2 hours and it took 6 hours to catch the last fish. 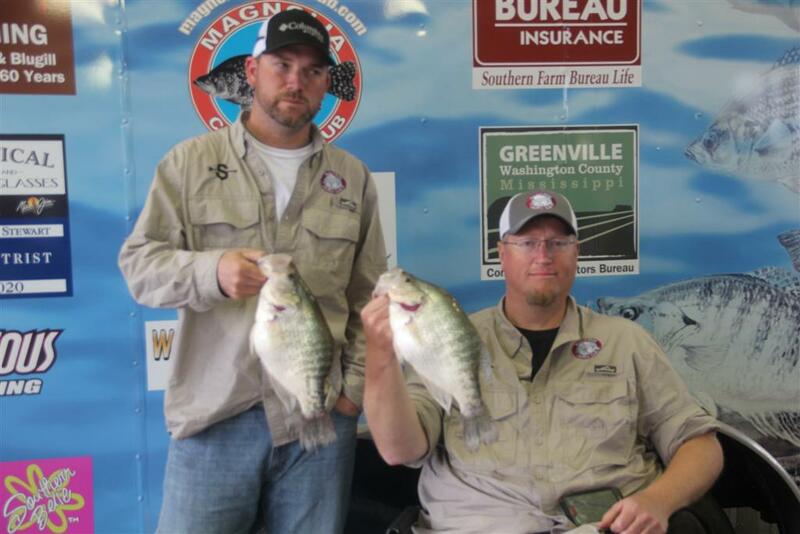 We know Jeremy & Clint are hooked on MCC now, this was their 1st time fishing a MCC Tournament and only the 2nd time fishing a tournament. Jeremy fished our BMO last fall. We’ll be seeing more of these Batesville guys. They’re planning on fishing all our tournaments. Finishing in 2nd place was the veteran team of Kent Driscoll & John Harrison. This team really don’t need any introduction. Somehow they seem to finish in the top 5 no matter where we choose to fish. Kent says they caught 2 fish in Perry Creek and then moved to Carver Point. They say it took 6 hours to catch the other 5 fish. Slow-trolling minnows seemed to be the ticket for these finicky Grenada fish. Shelton and David have got to be the luckiest guys I’ve ever met. They weighed in 1 fish but it was good thinking to enter the BMO. We had a fish weighed in that was much heavier (2.73#) than their 2.53# but due to the fact that the team decided not to enter the BMO team Culpepper & Thornton were the winners of the $1,500 & the $500 in B’n’M Bucks. Shelton wasted no time in paying David his part. I seen him count out $750 in cash and hand it to David. Shelton, anybody that’s got that much money don’t need to be fishing. You should have been at Tunica. Oh well, the ones that needs the money never seem to win the money. 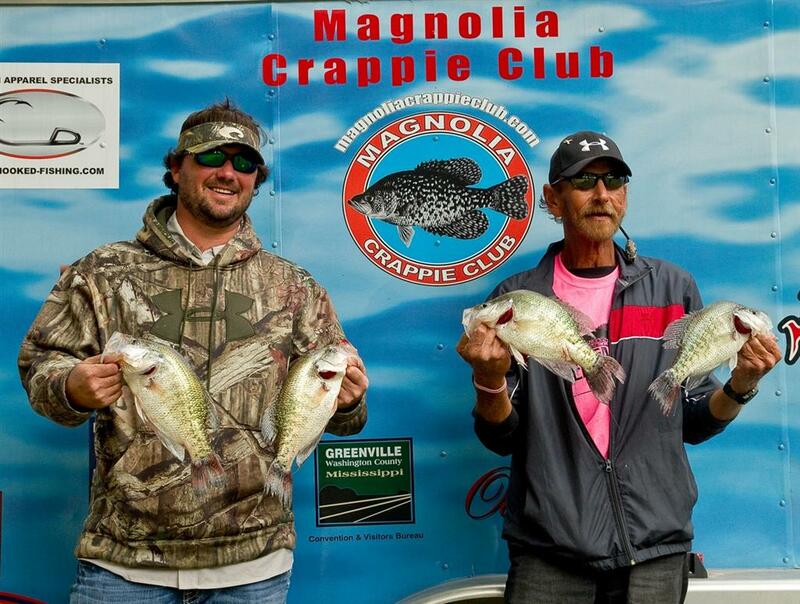 Congratulations guys, y’all deserve the win cause you’ll probably spend it all at the Crappie Master National Championship. I would also like to thank everyone that stepped up and helped with the registration and weigh-in. We also want to say a special thank you to Mike Ward and his staff from War-Eagle Boats for the cookout. That was some excellent food. Those ribs were delicious. Thank you Mike. You not only make excellent boats but your grills are top of the line. The 2013/2014 season is off to a wonderful start. We had a club record number of team enter this tournament (53 teams). I know it would have been more had it not been for the bad weather. But most of you know, nothing can stop a determined fisherman. It started off kind of gloomy but it ended up being a beautiful day. As they say, a bad day fishing is better than a good day working. John Harrison & Kent Driscoll finished 2nd with 11.24#’s. Excellent job guys. That sun hat kills me. Way-To-Go……………..
Jerry Gross & Jay Carr placed 3rd with 10.67#’s. Congratulations guys, brand new team. 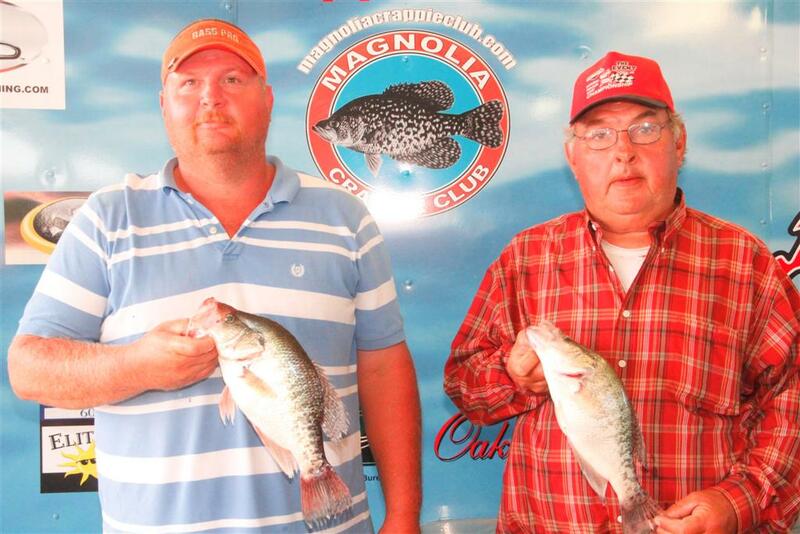 4th place was captured by Rabbit Rogers & Pat Jeffcoats with 6 fish at 10.29#. The jig pole team did it again. Good job guys. Roger & Katie Womack placed 5th with 8.53#’s. This husband and wife team continues to be tough to beat. Great job. Kent Holmes & Donnie Praytor - 2.72#’s.